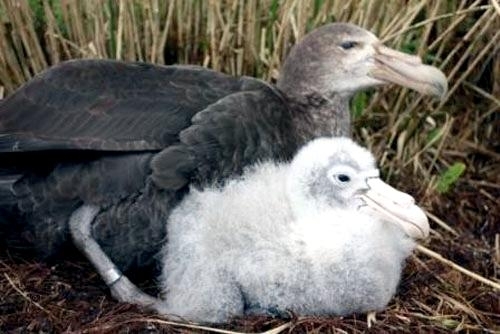 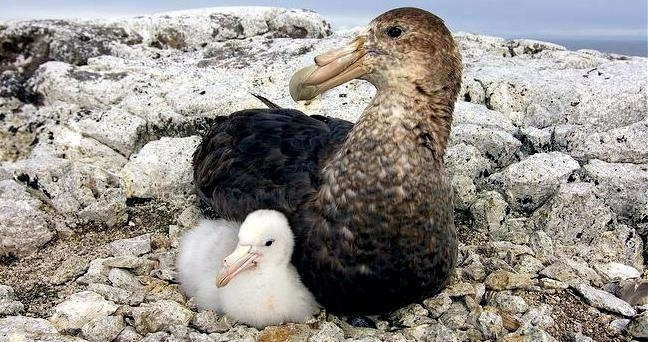 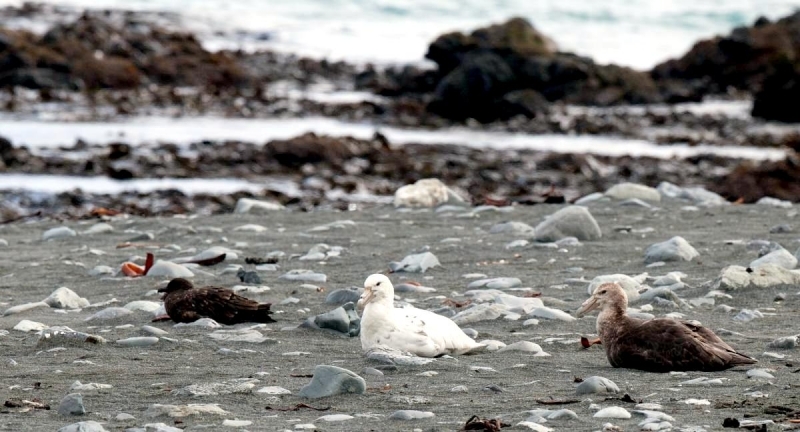 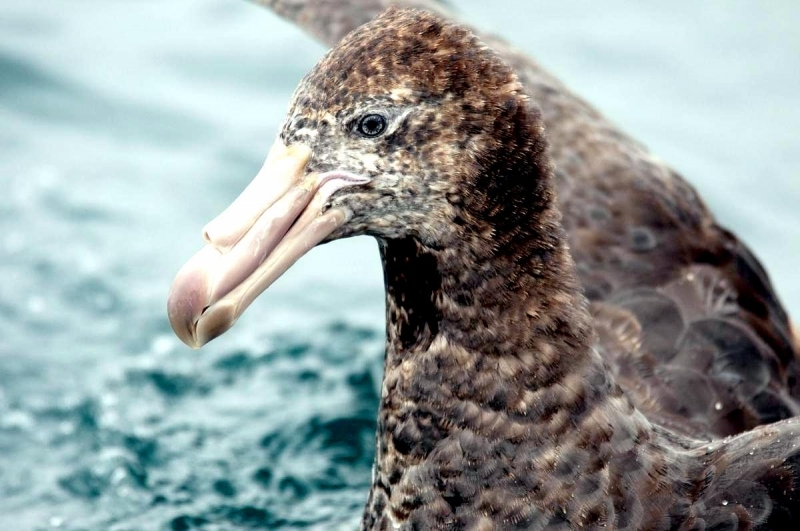 Giant Petrels have 2 distinct color phases, white & dark. 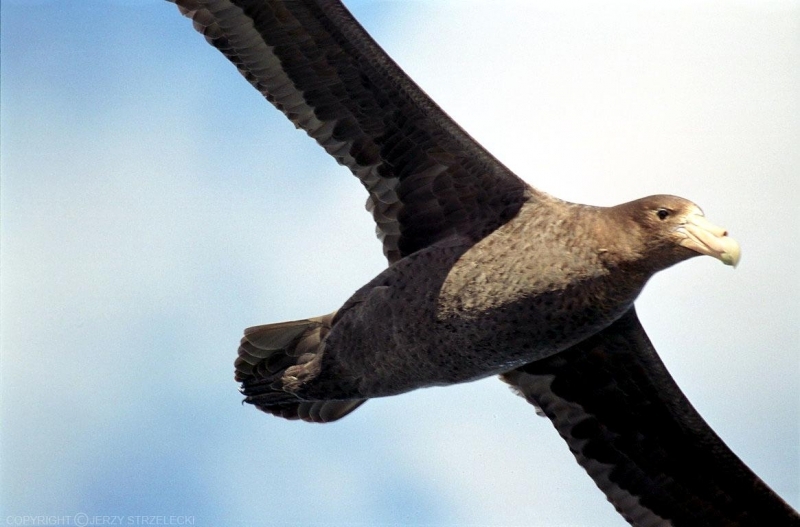 Dark-phase adults have a grey-brown body with white head, neck and brown speckled breast. 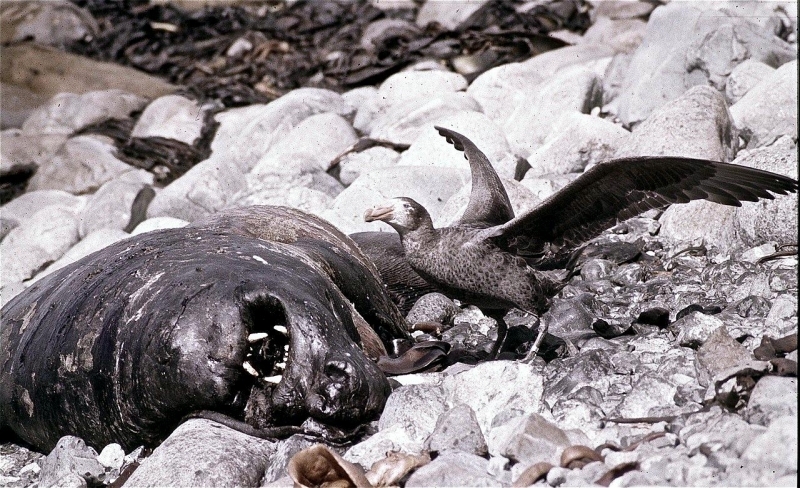 Juveniles of dark-phase birds have a dark brown body with a dark brown iris. 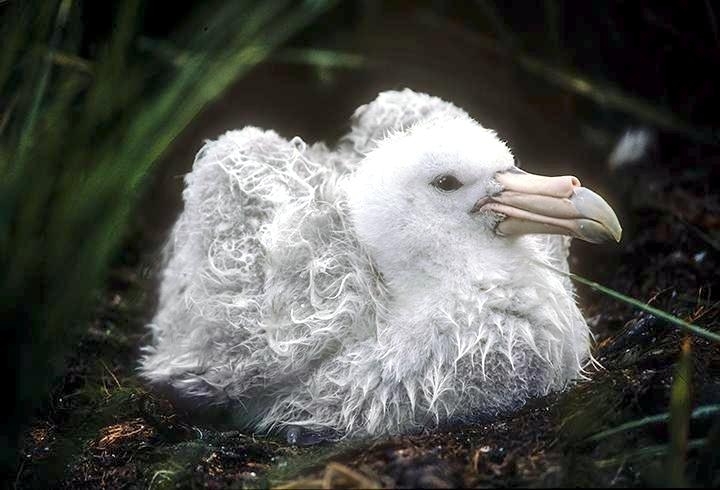 White-phase birds are completely white except for a few scattered dark feathers and generally constitute a maximum of 5% of a population. 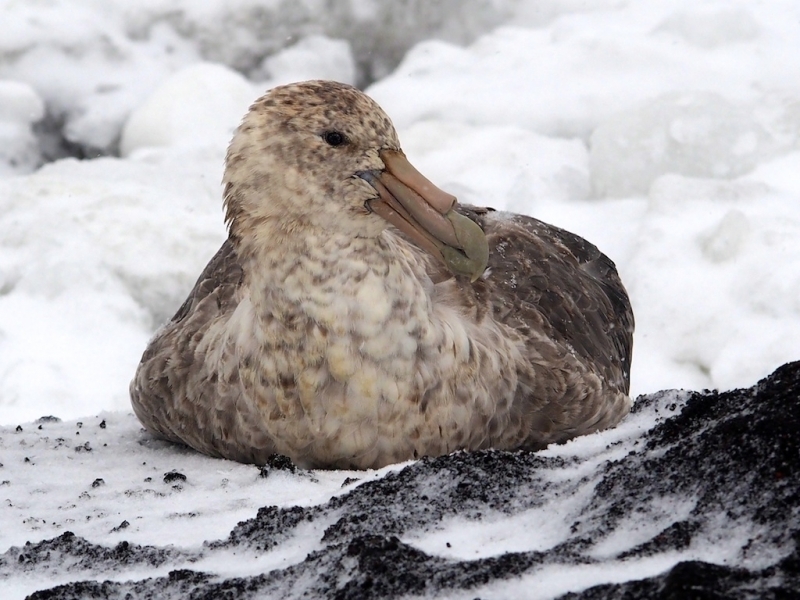 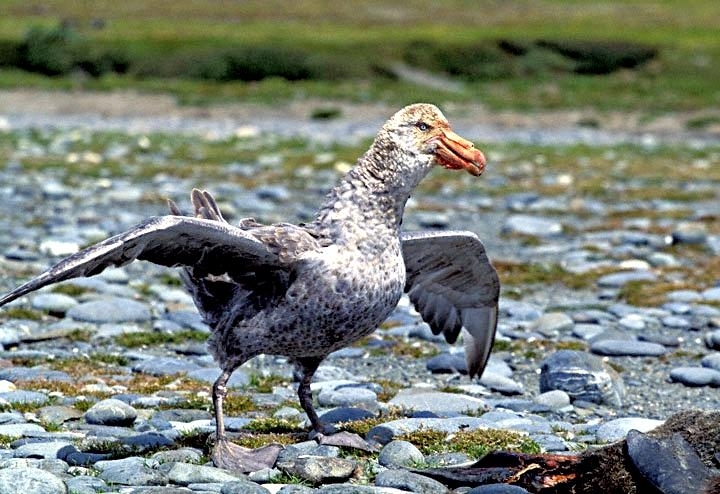 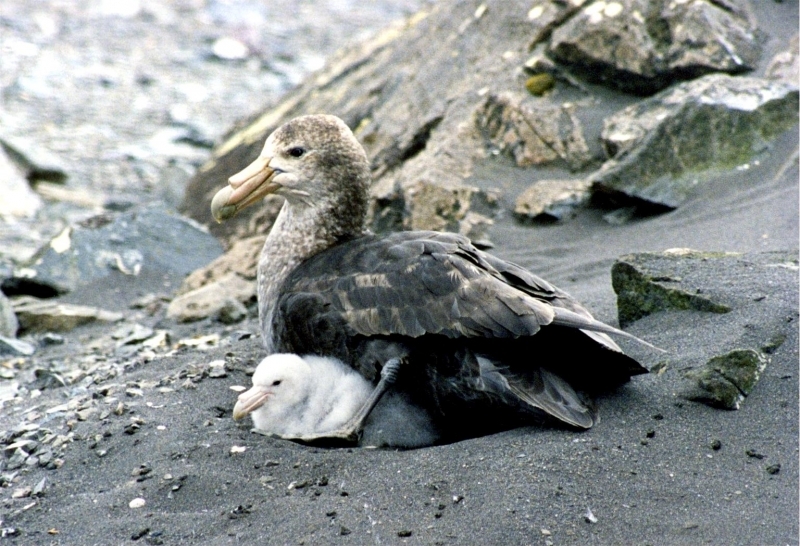 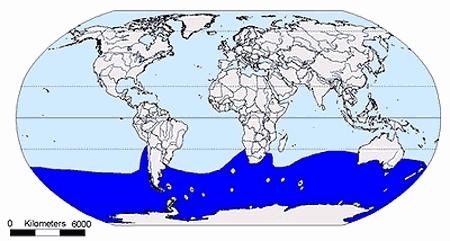 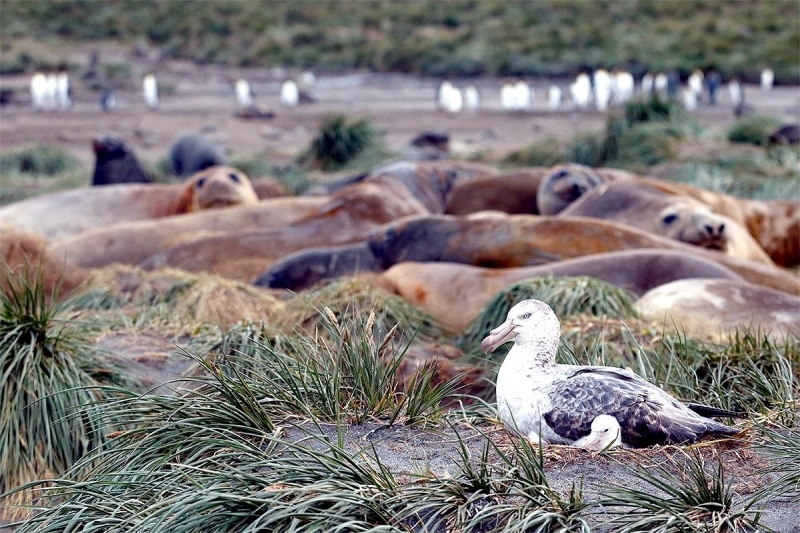 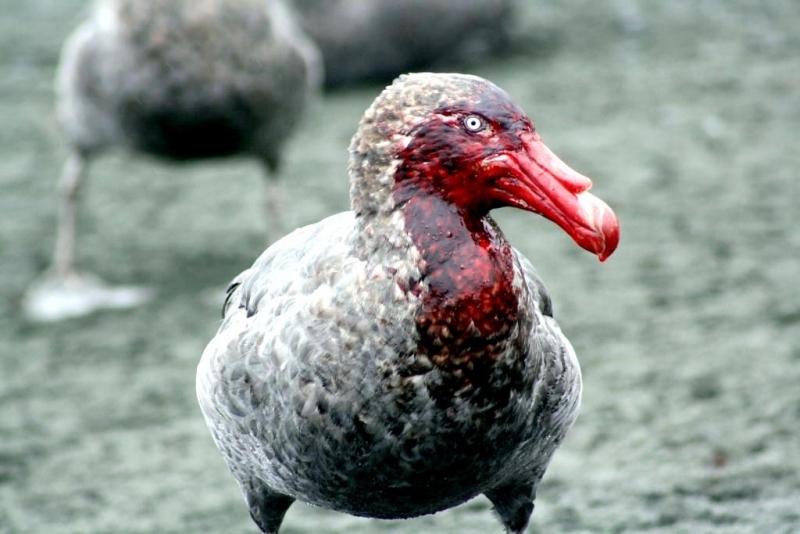 Giant Petrels breed on the Antarctic continent, Antarctic Peninsula and on sub-antarctic islands including Heard Island, South Georgia Island, Marion Island and Iles Crozet. 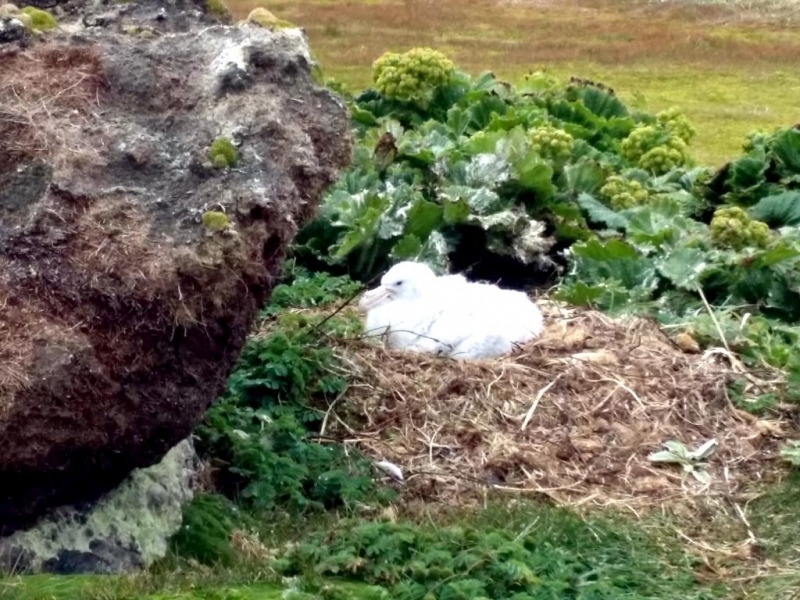 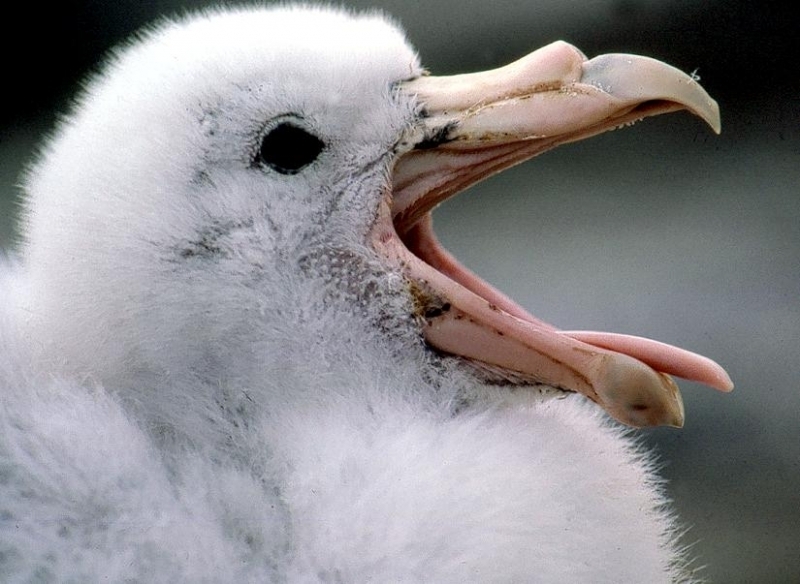 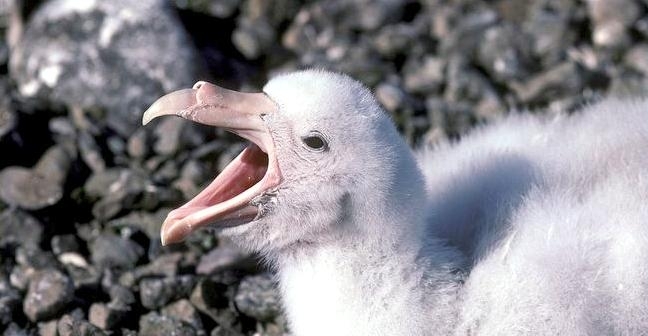 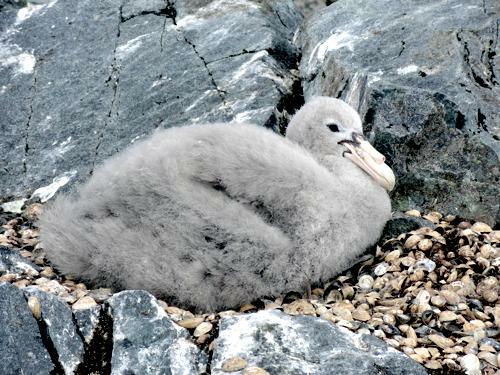 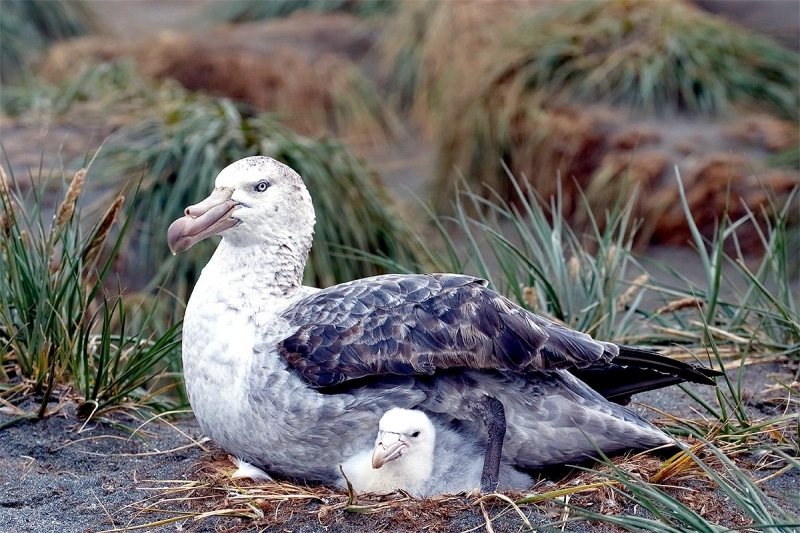 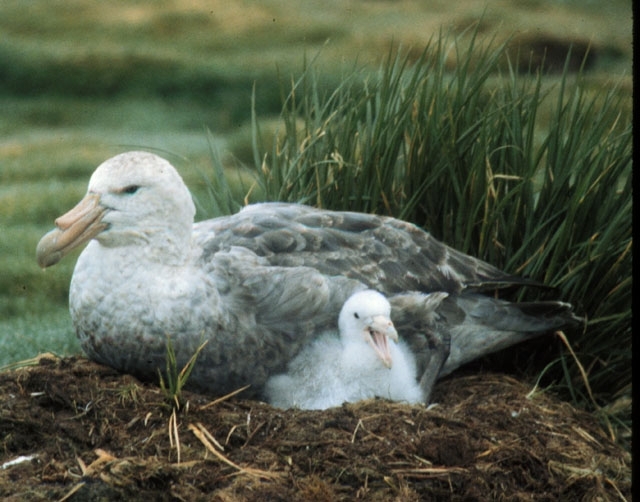 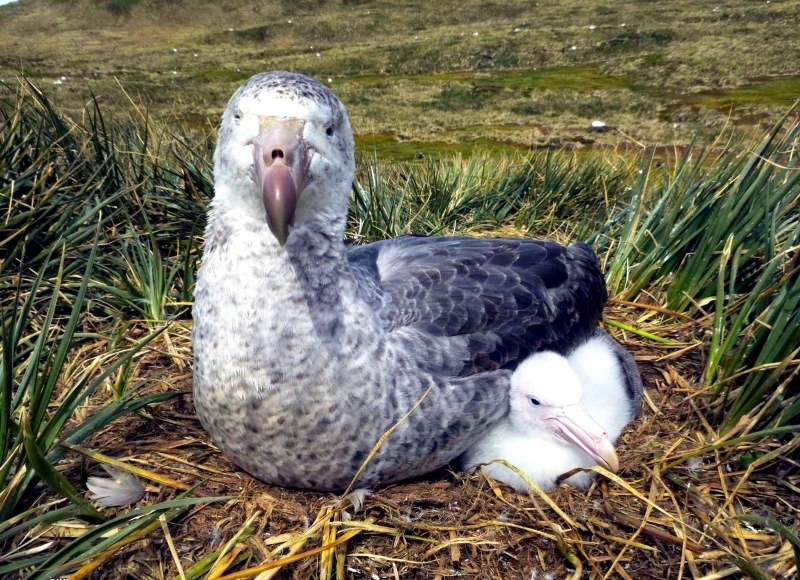 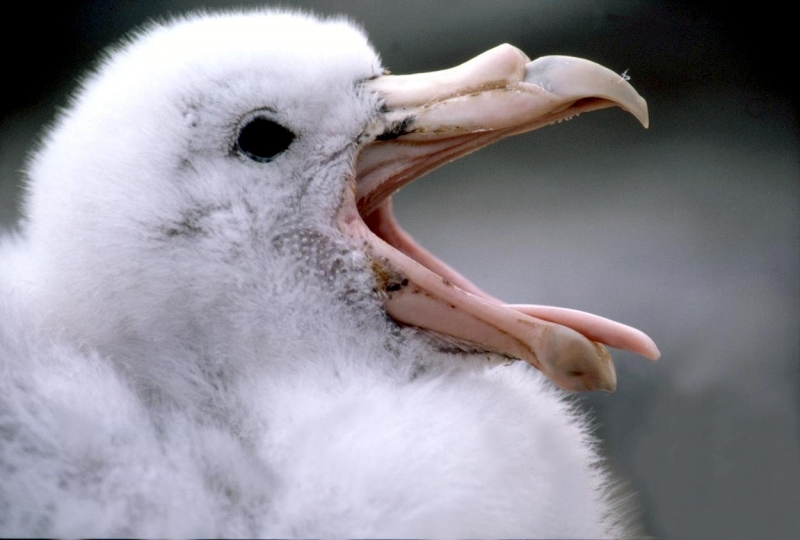 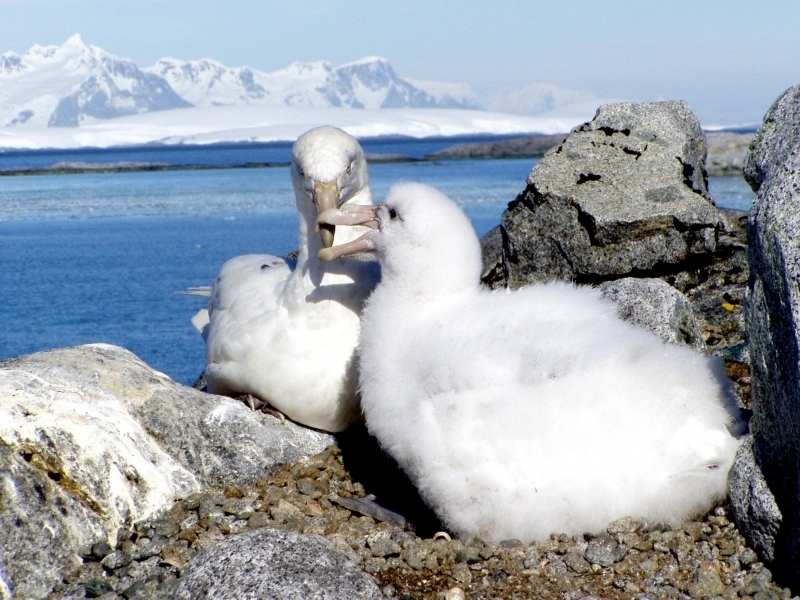 Giant Petrels nest in ice-free coastal areas, rocky bluffs, open flats, edges of plateau or offshore rocks. 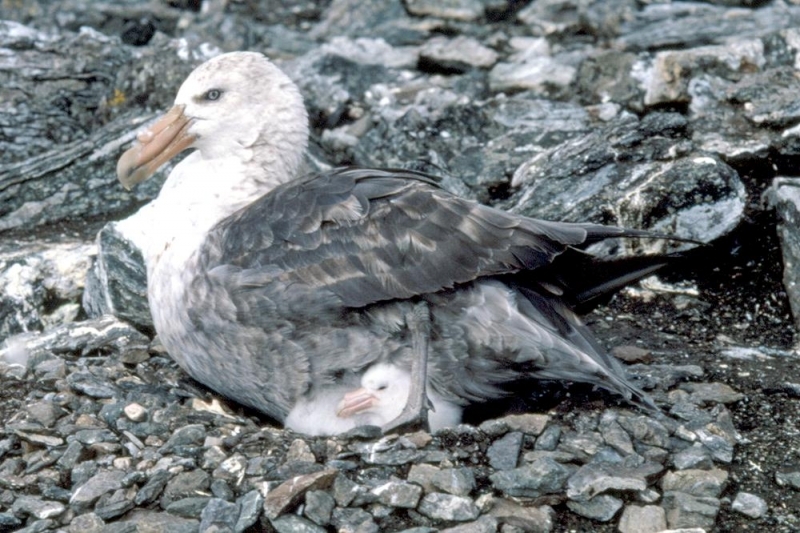 However even though nests may be totally covered by snow, the parental birds often continue to sit on them to protect their eggs or chicks from the potentially fatal cold. 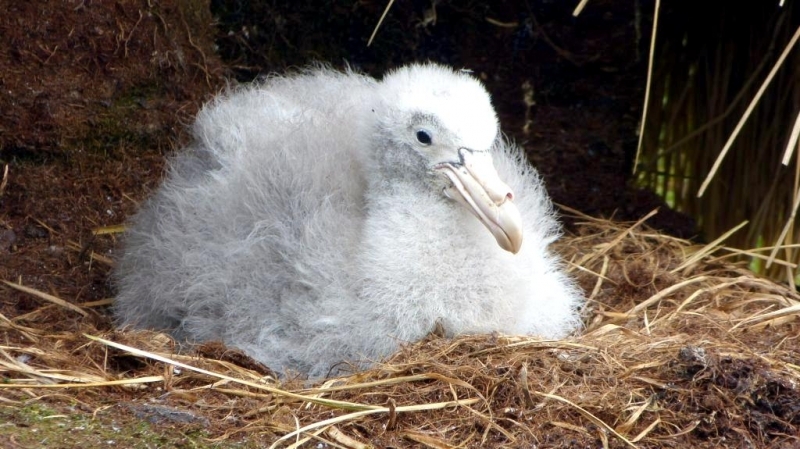 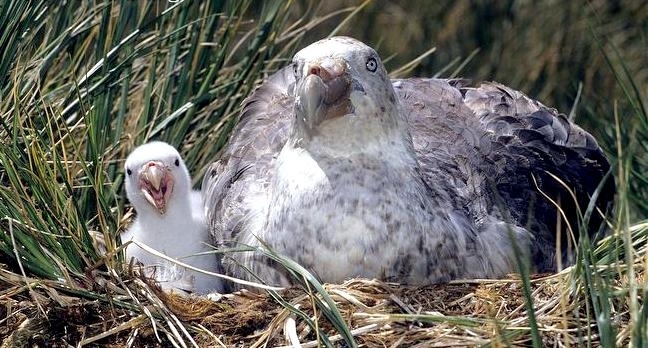 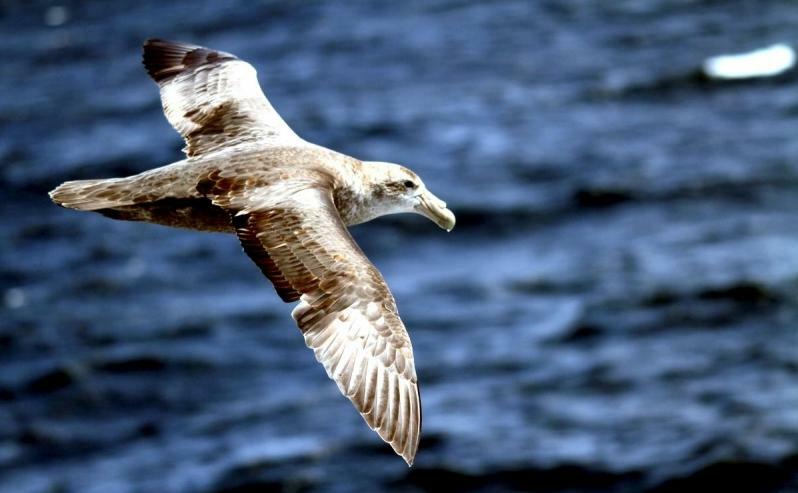 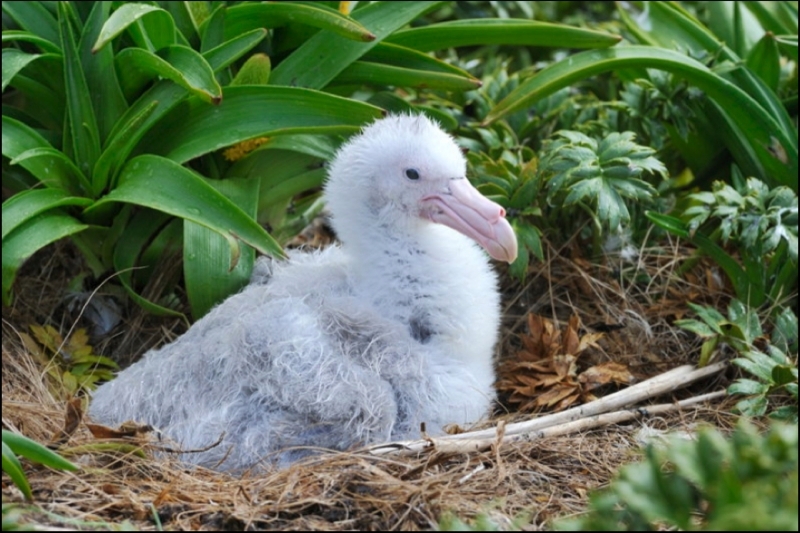 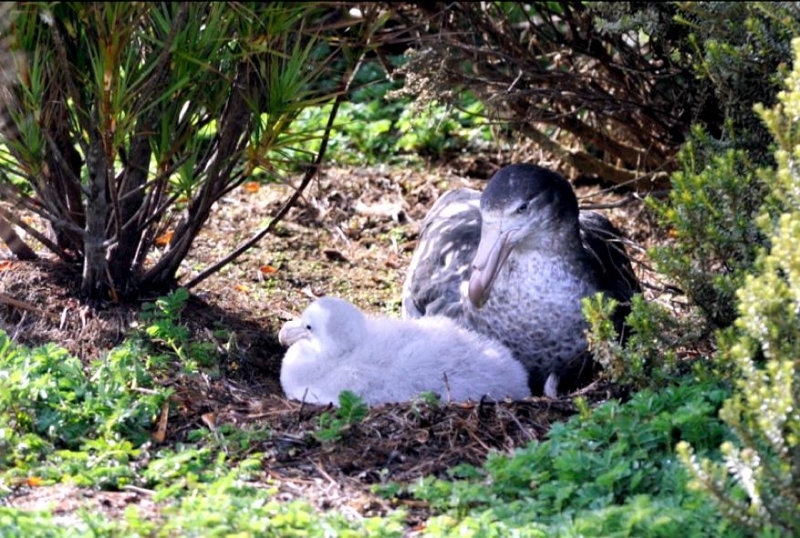 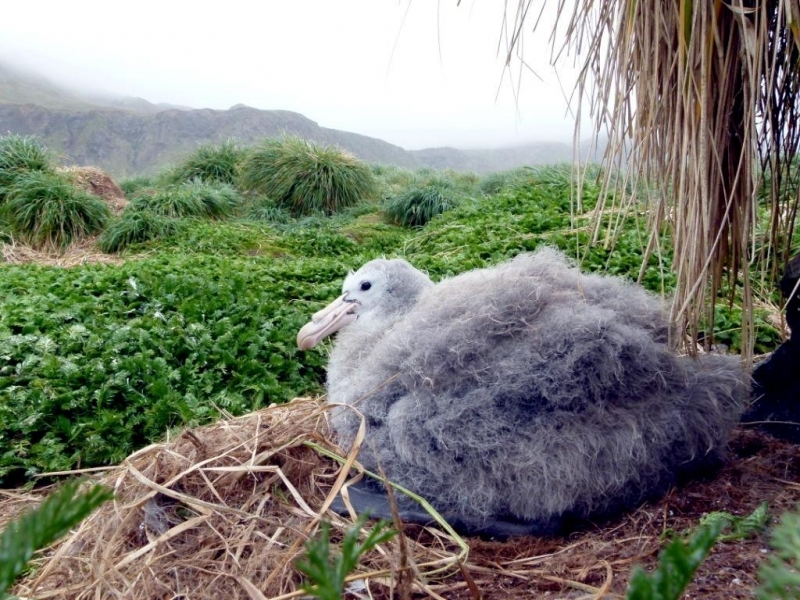 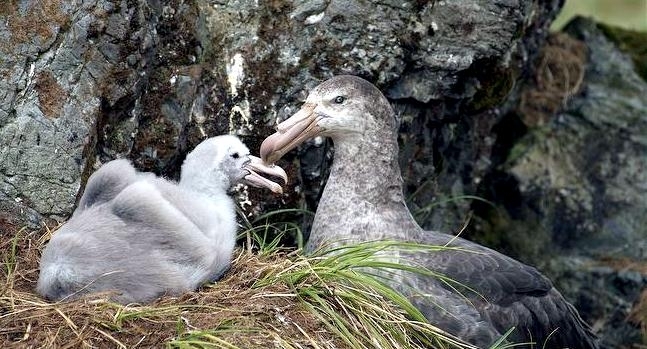 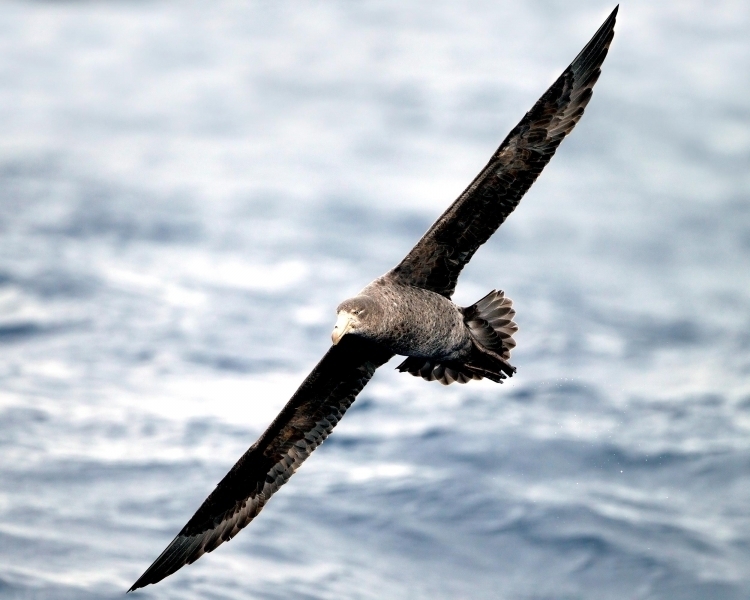 Giant Petrels tend to return to the same nesting sites every breeding season. Some pairs have been observed returning to the same nest year after year. 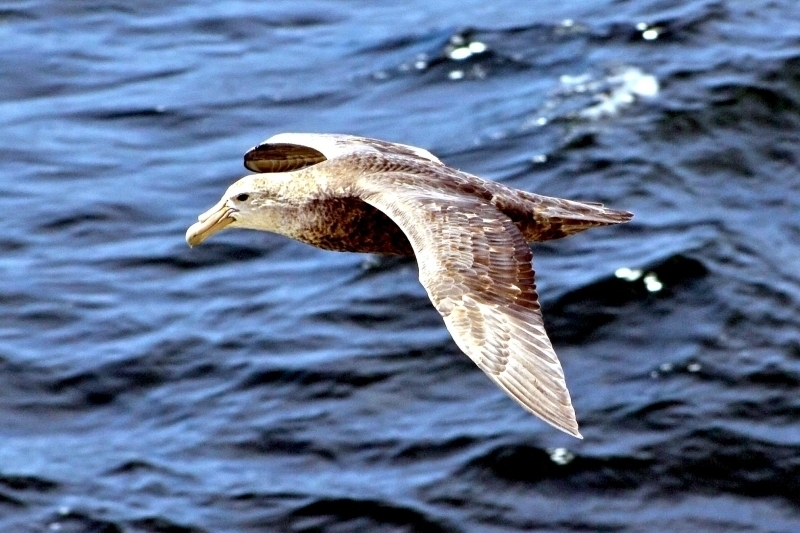 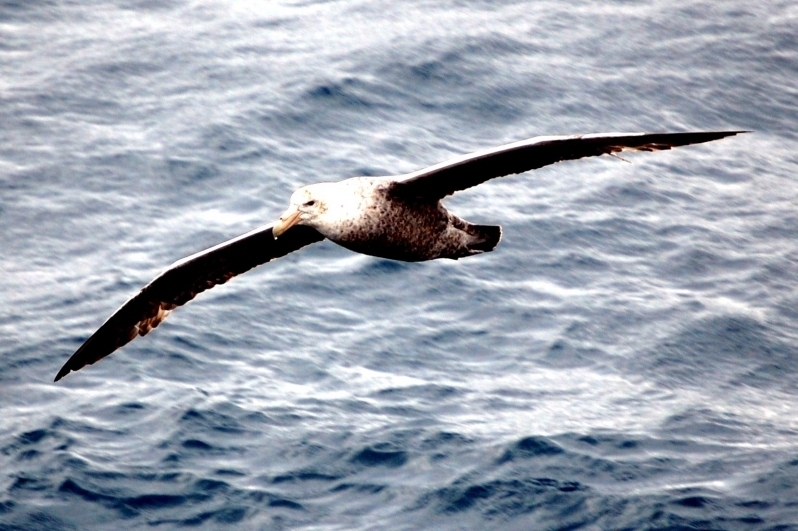 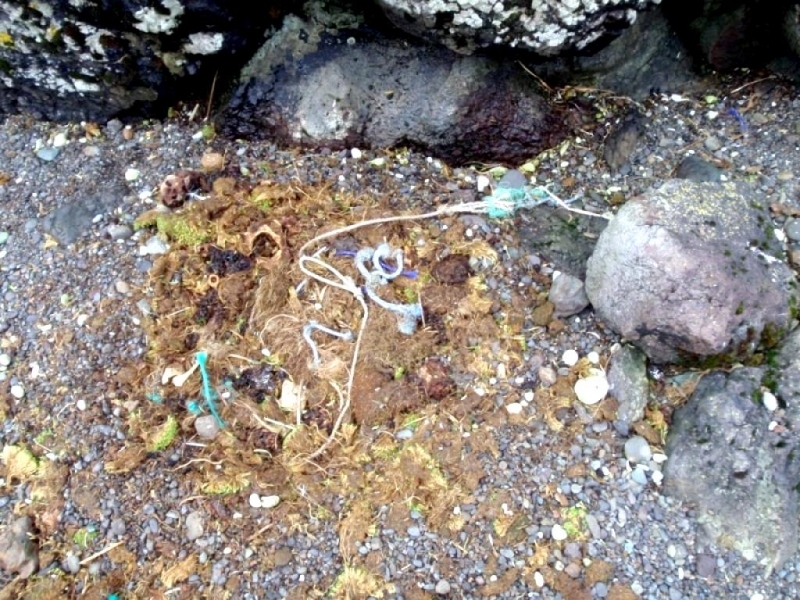 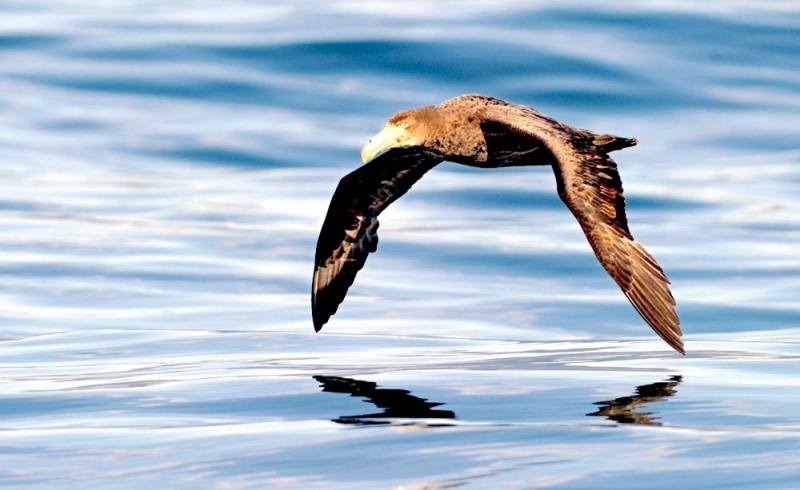 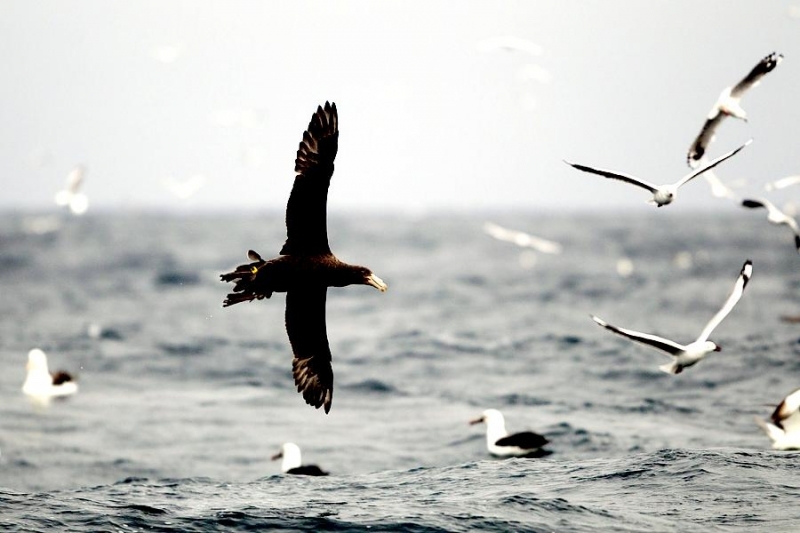 These seabirds often feed close to vessels fishing with long-lines. 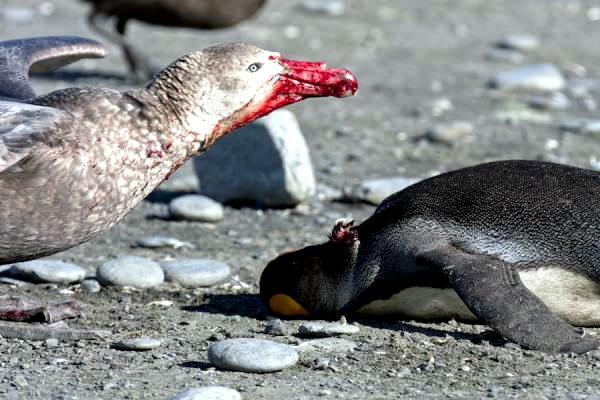 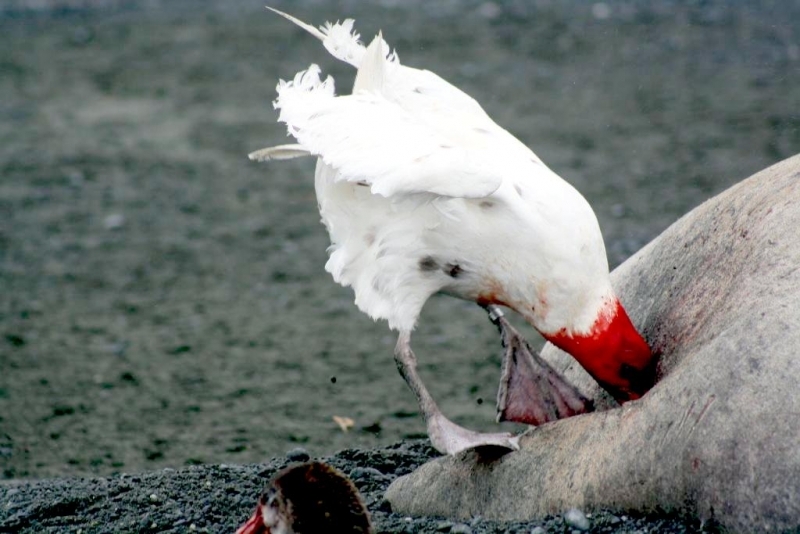 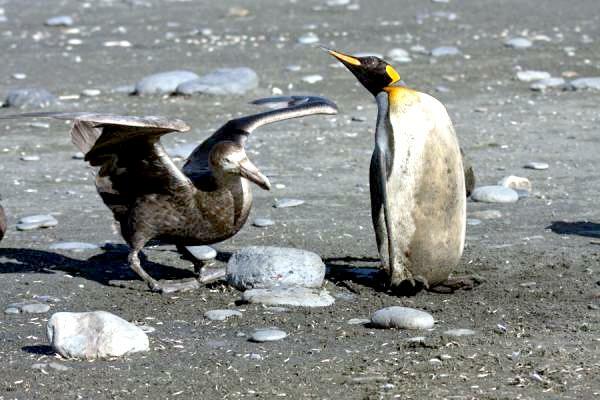 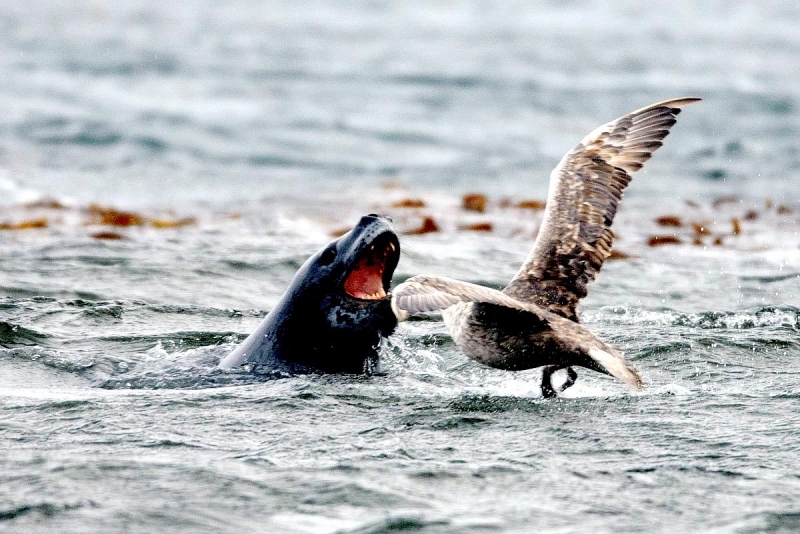 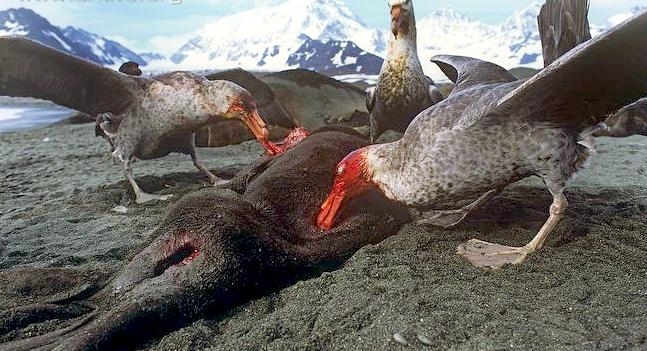 They also prey upon penguins, other birds, krill, crustaceans, fish and squid. 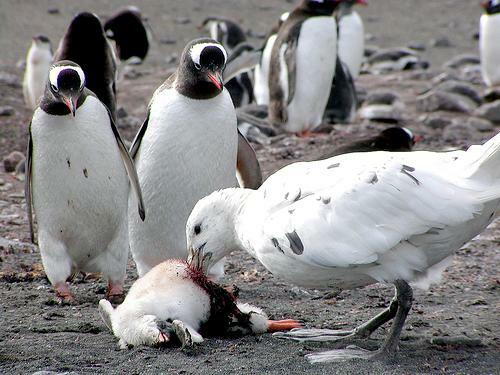 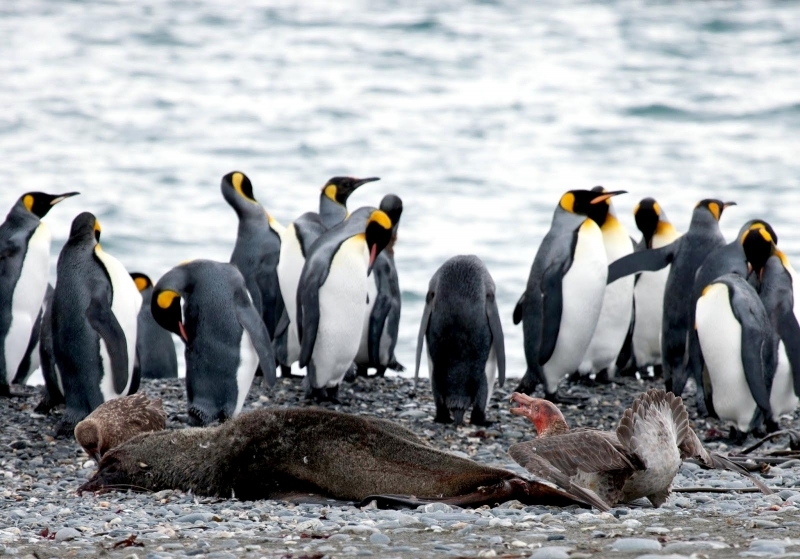 During chick rearing, they depend heavily on penguin & seal colonies as a food resource. 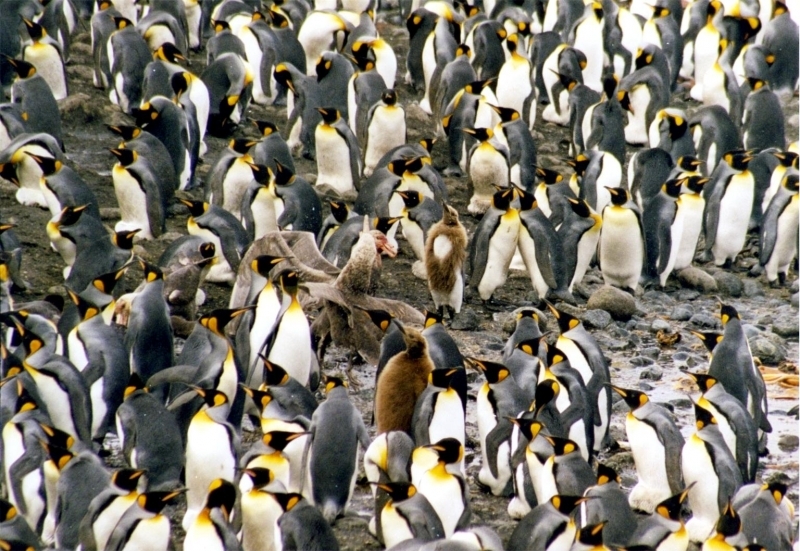 During the breeding season, loose colonies form at the breeding sites. 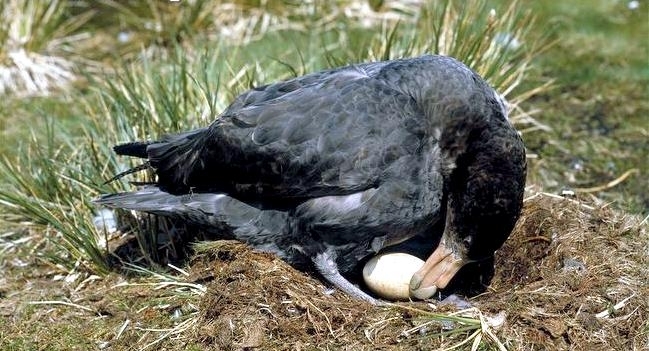 During October or November, they lay 1 large egg into a low cup-shaped nest made of grass, moss and gravel. 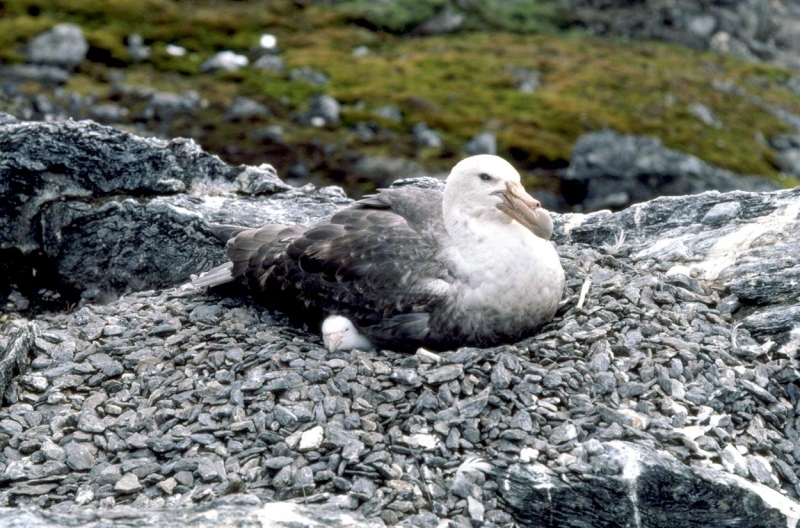 The eggs are incubated for 55 to 66 days. 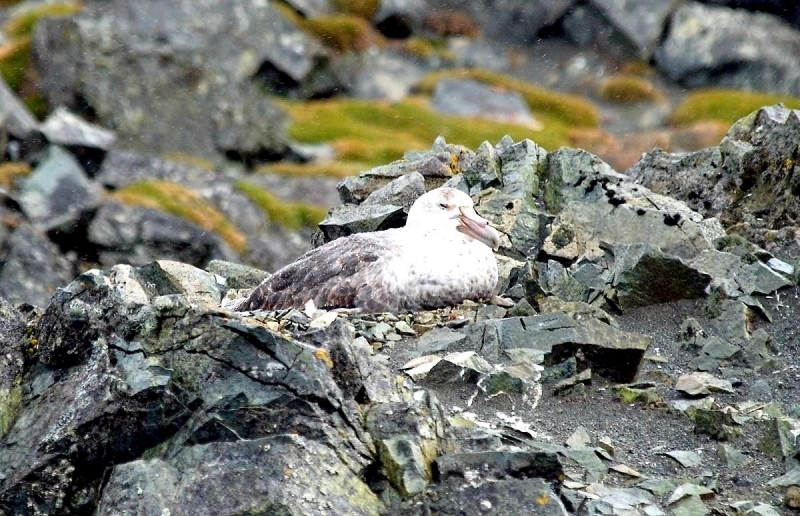 The chick remains in the nest until it fledges towards the end of March. 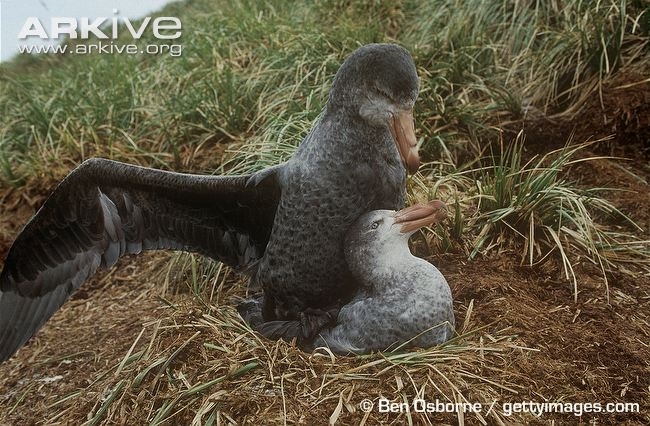 Giant Petrels are very susceptible to disturbance during the breeding season and tend to abandon the nest if they are threatened. 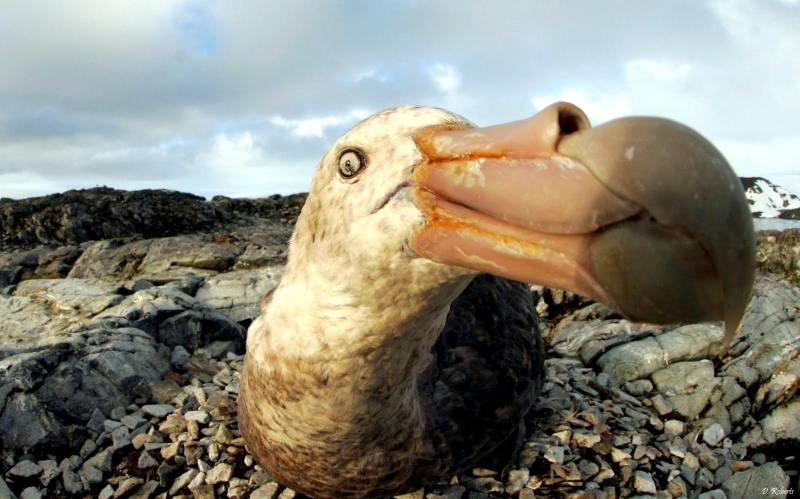 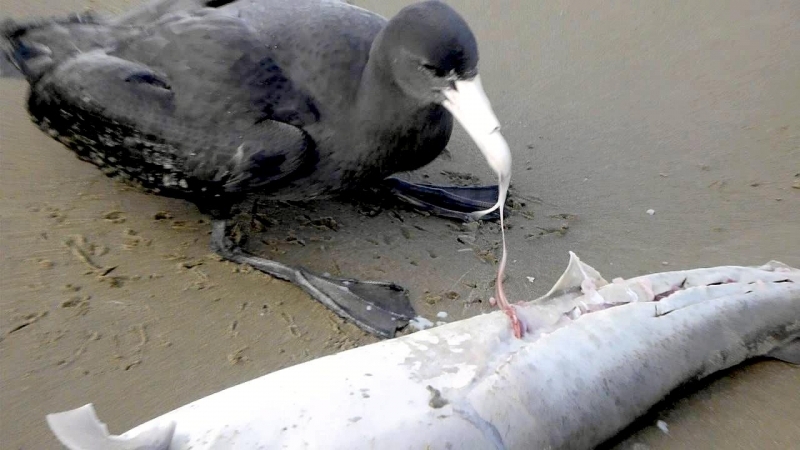 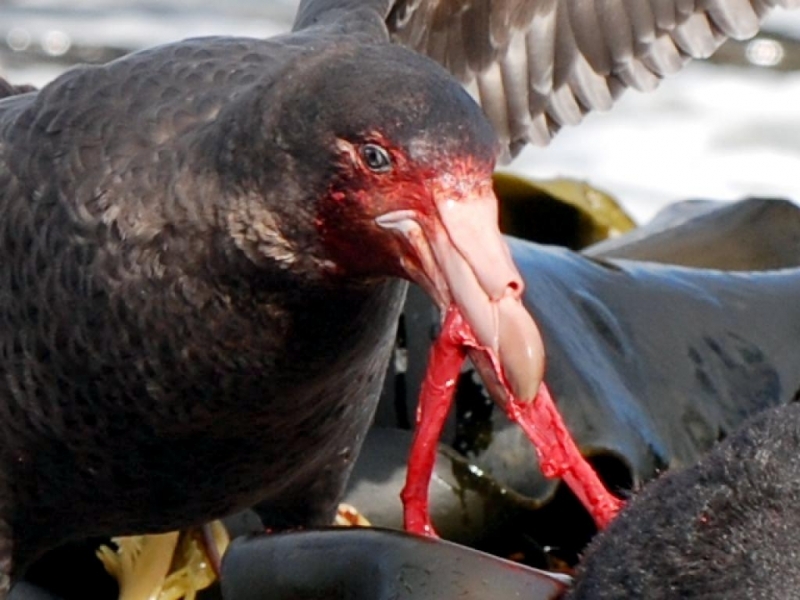 Giant Petrels are able to regurgitate foul-smelling oil which they spit at intruders; this habit earned the Giant Petrel the alternative name of “stinker”. 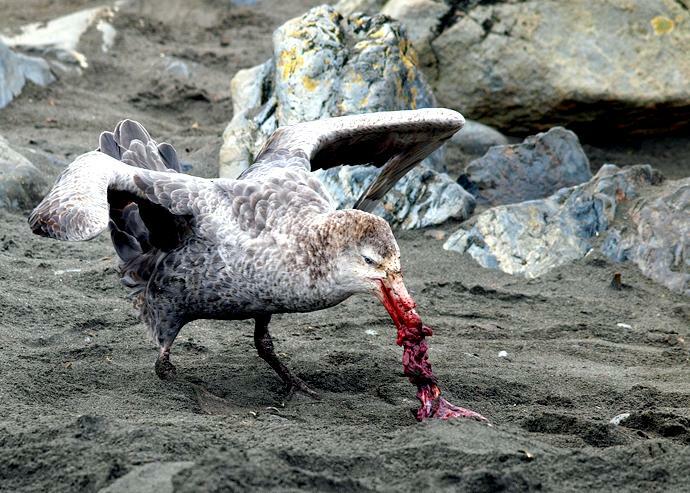 Both Giant Petrel adults & chicks can regurgitate foods and oils to a distance of a meter or more if they are disturbed. 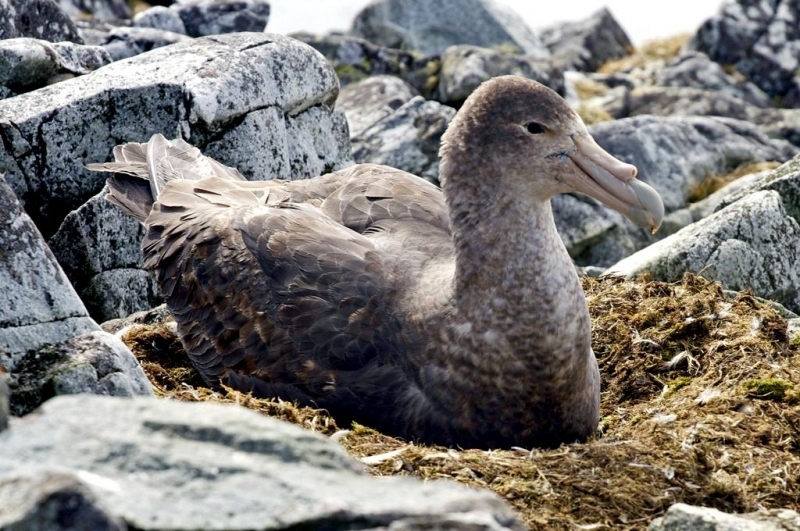 After fledging, juvenile Giant Petrels spend their first 2 or 3 years of life at sea on an extensive migration, in which they circumnavigate the Southern Ocean. 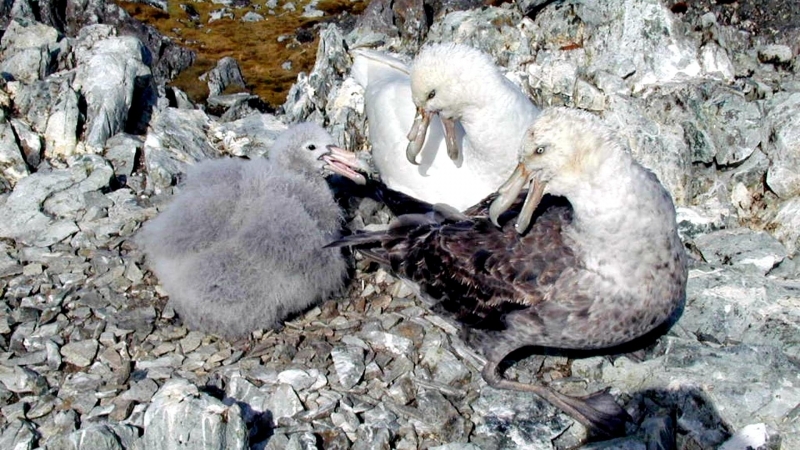 Although this species may begin to breed at 4 years, most individuals begin to breed between 6 and 10 years of age. 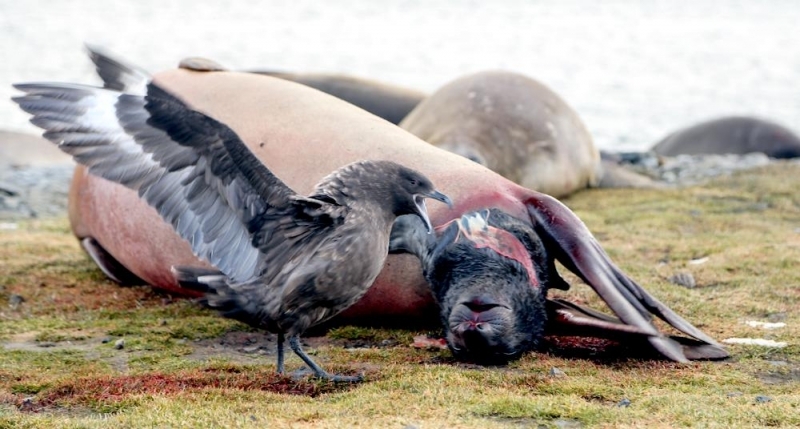 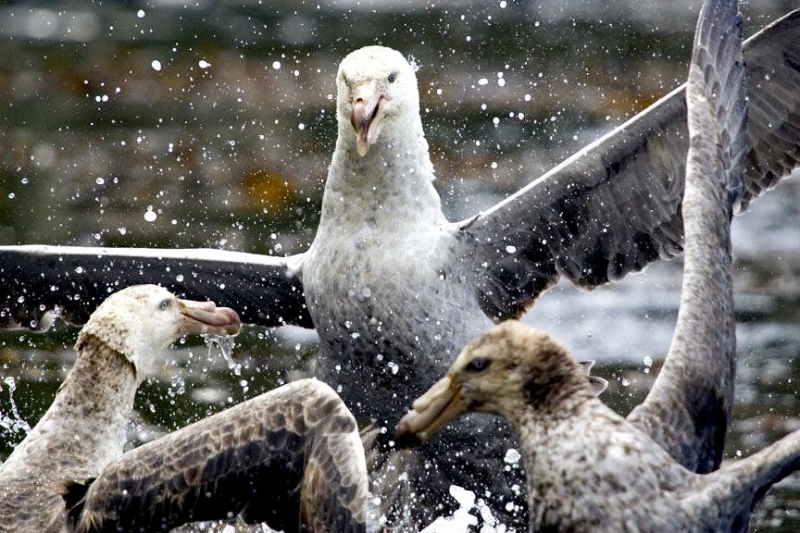 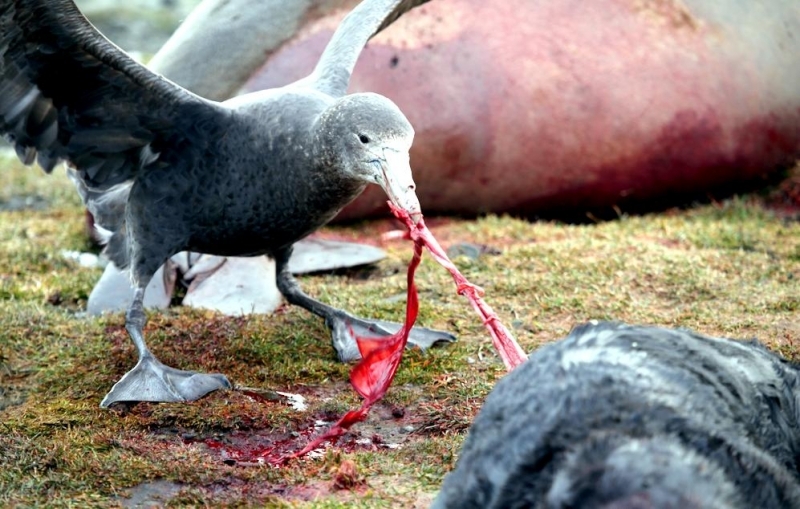 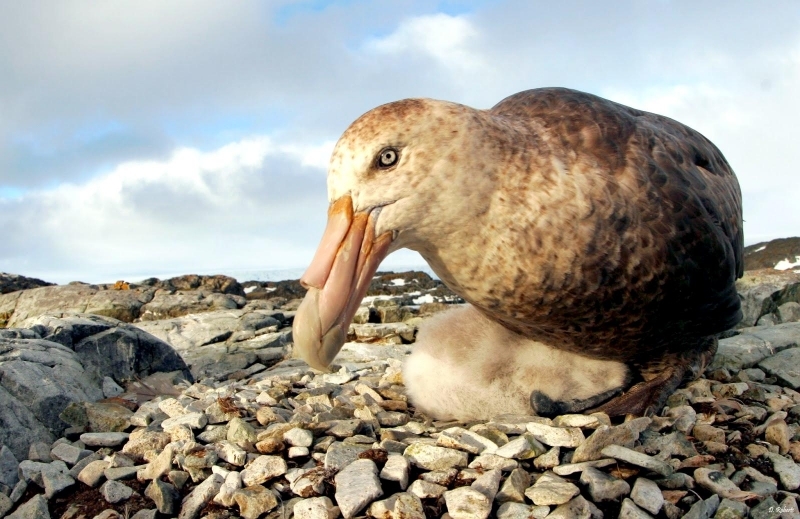 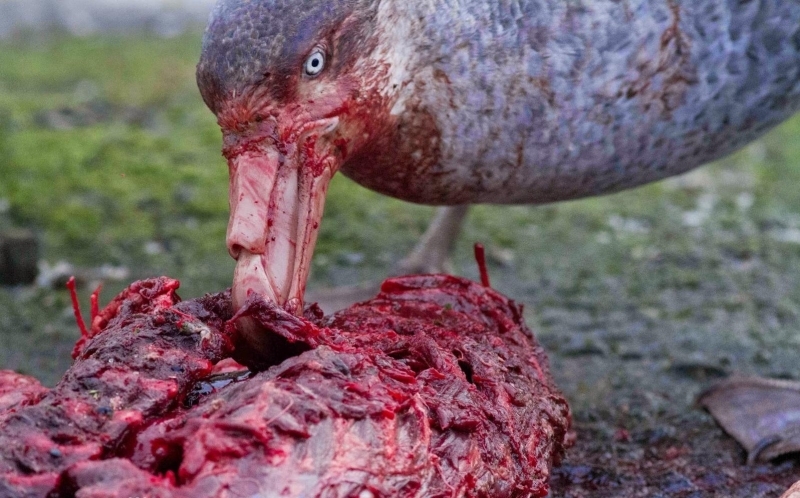 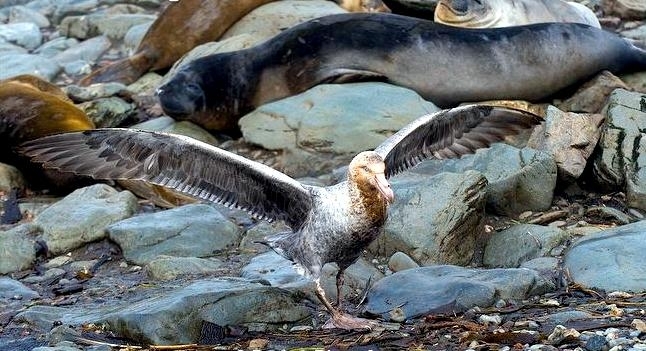 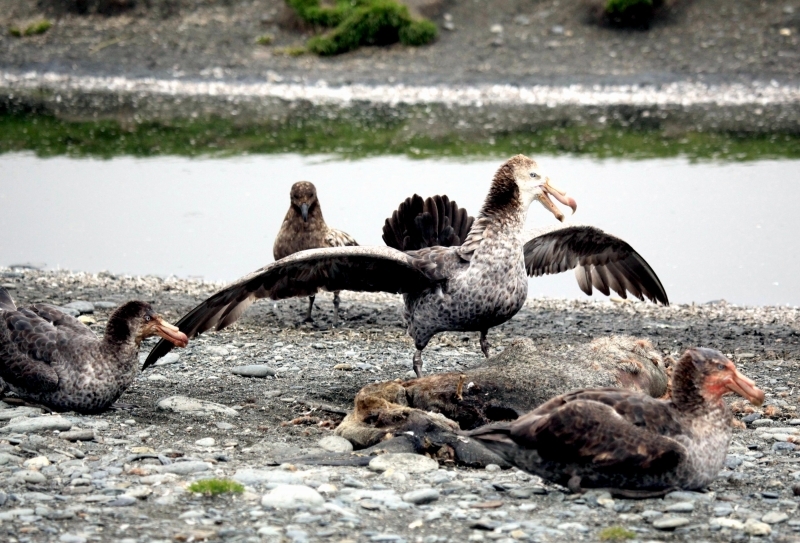 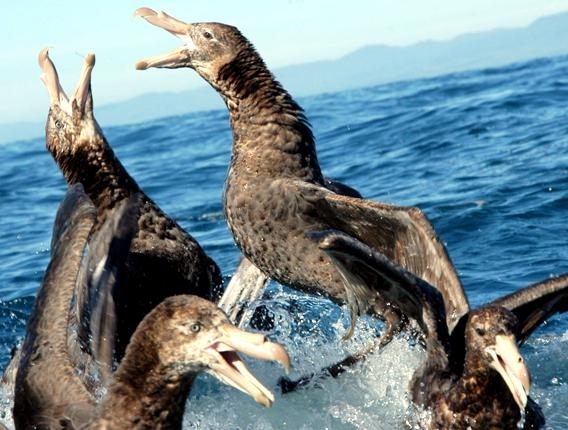 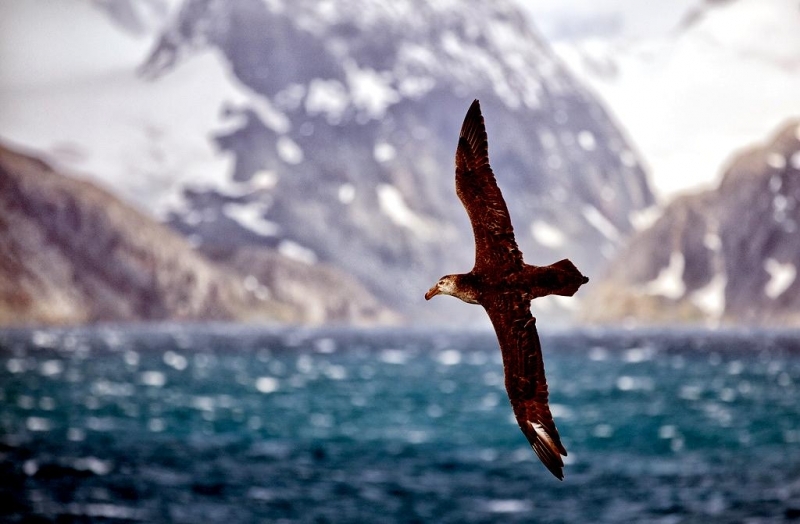 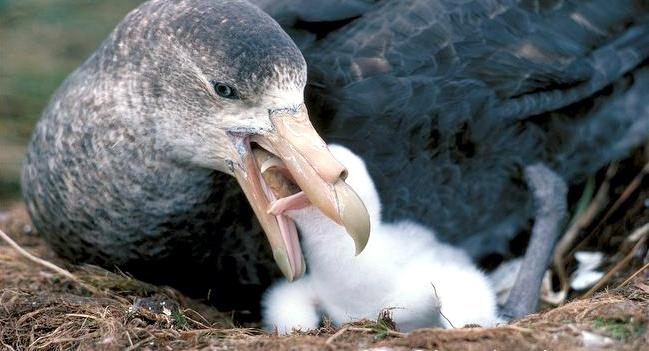 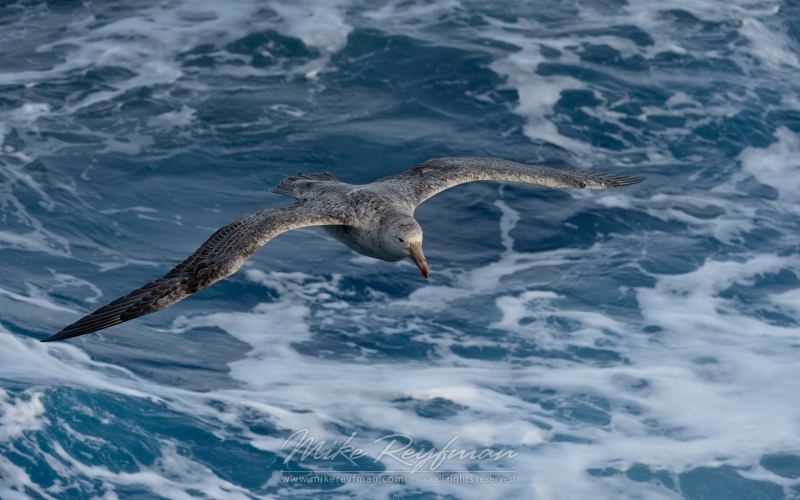 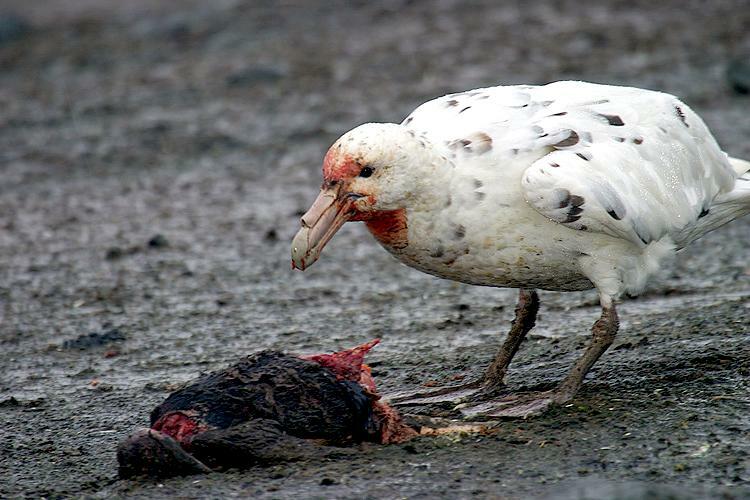 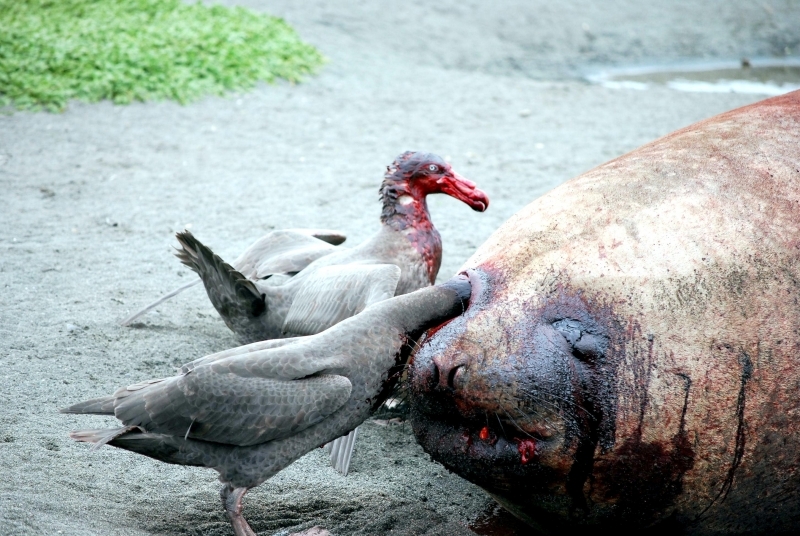 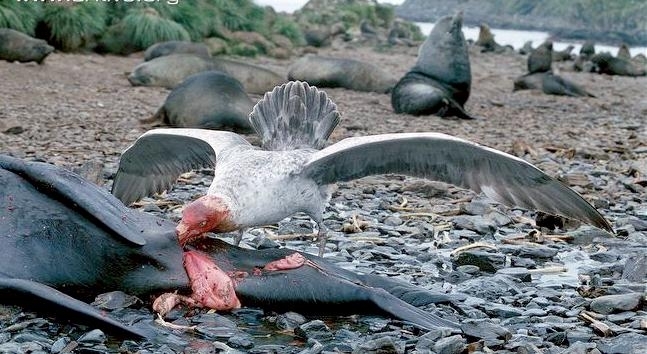 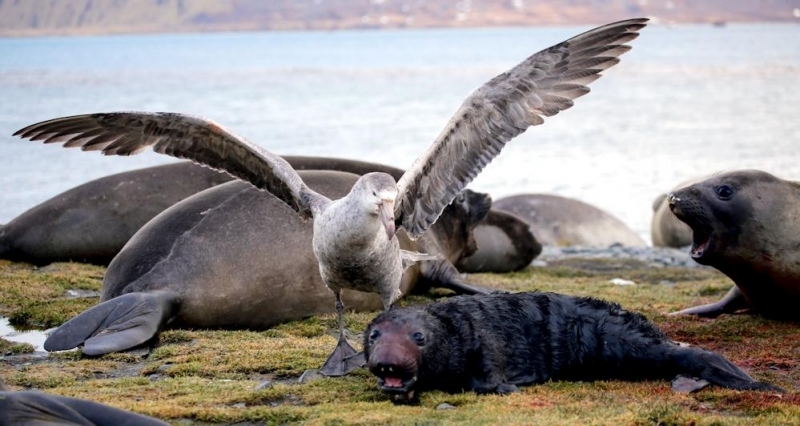 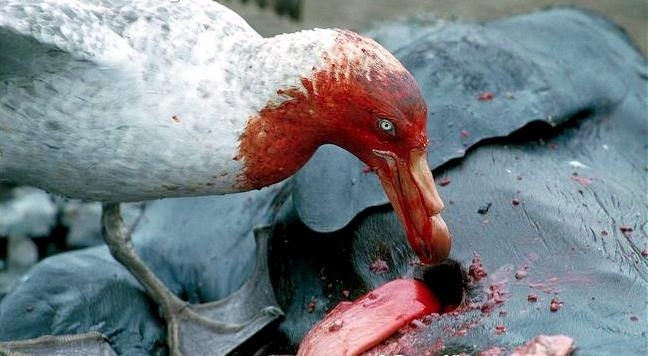 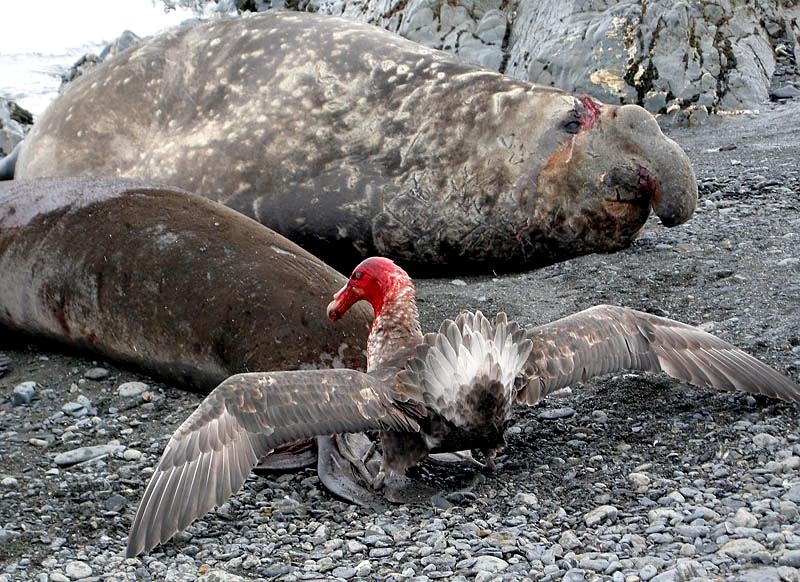 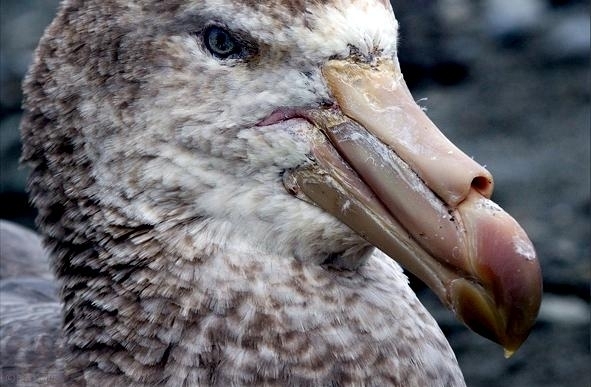 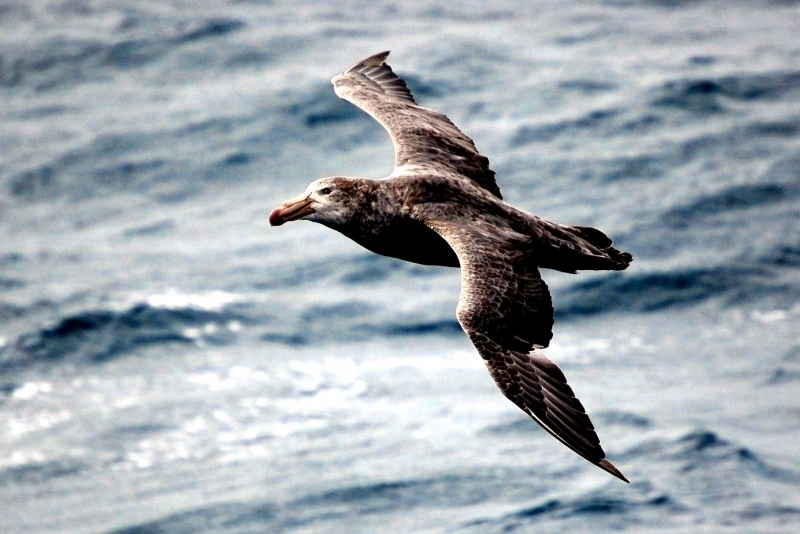 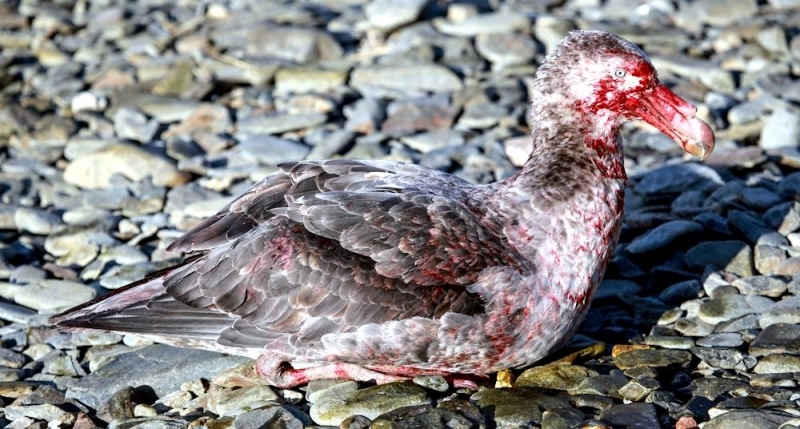 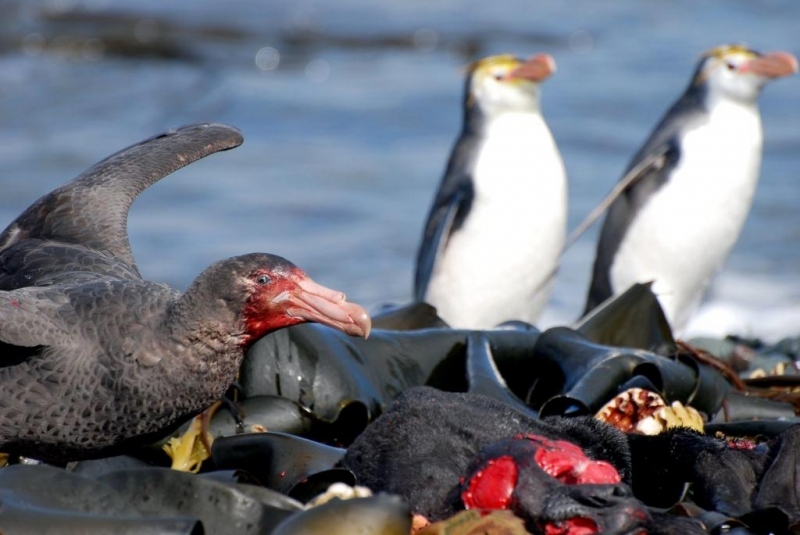 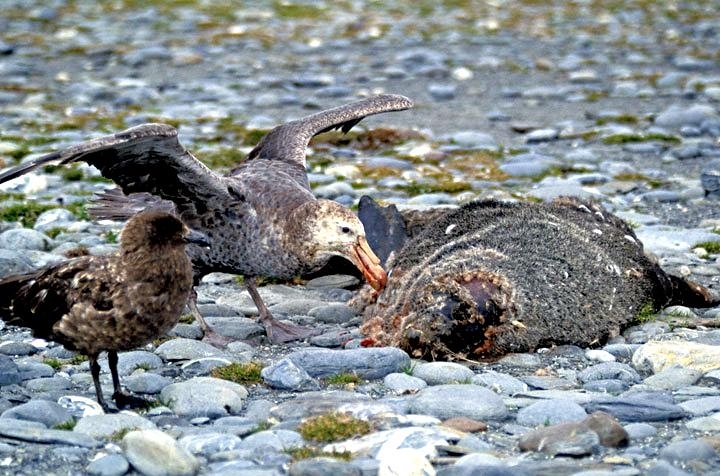 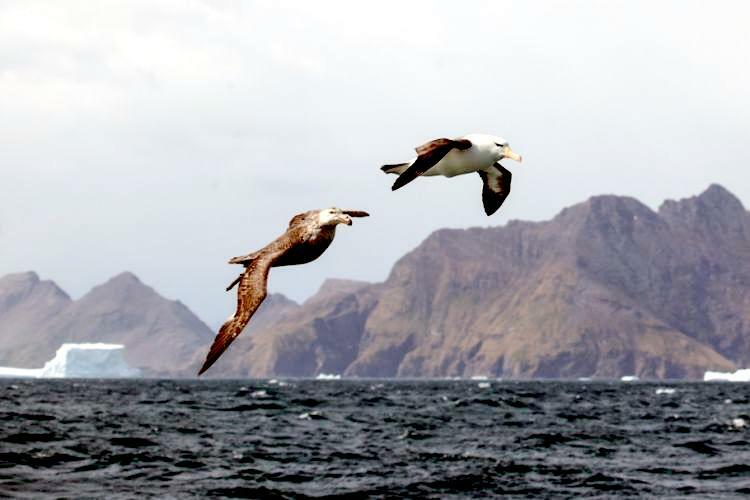 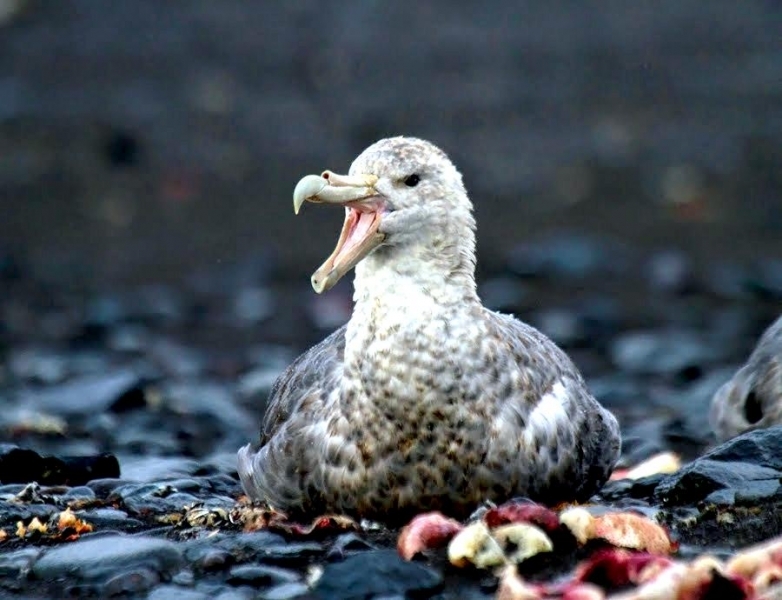 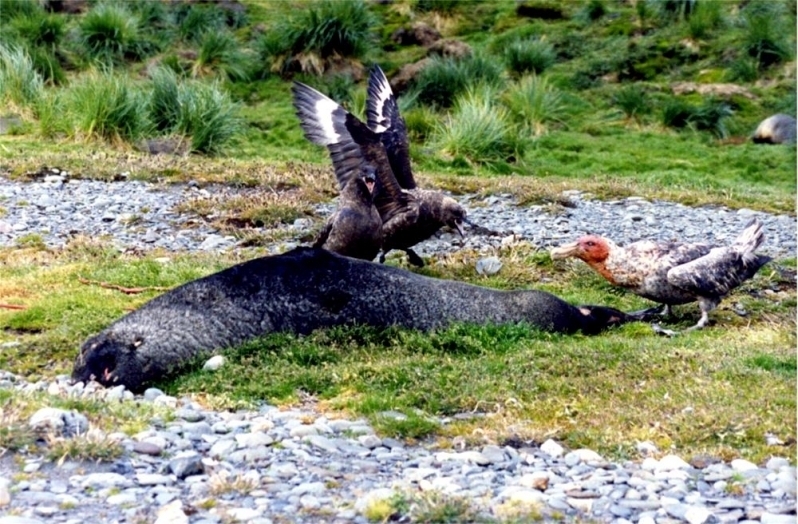 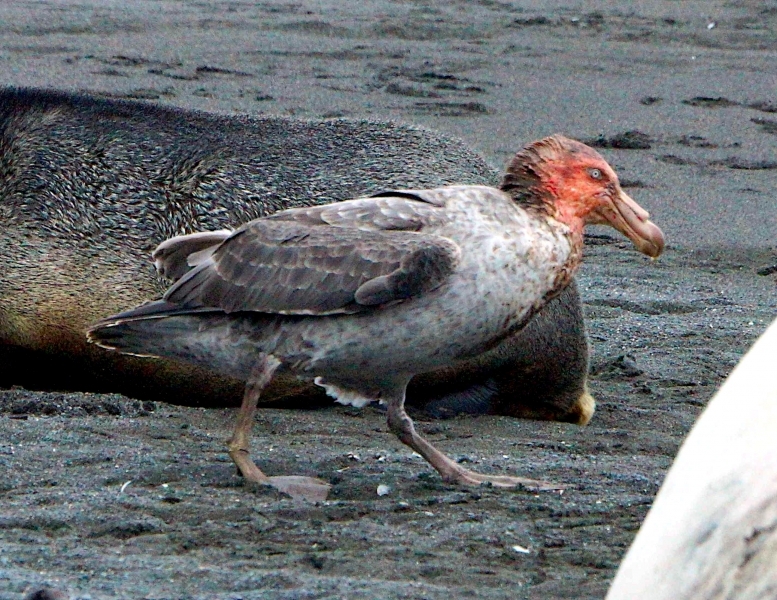 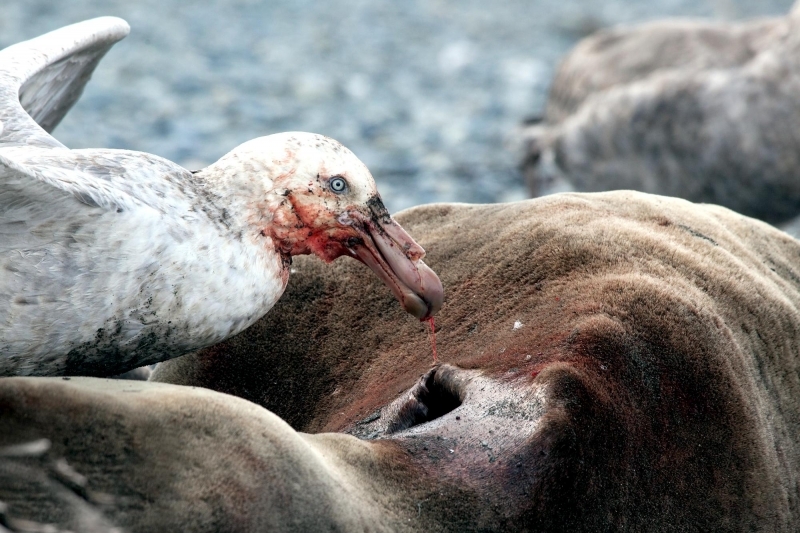 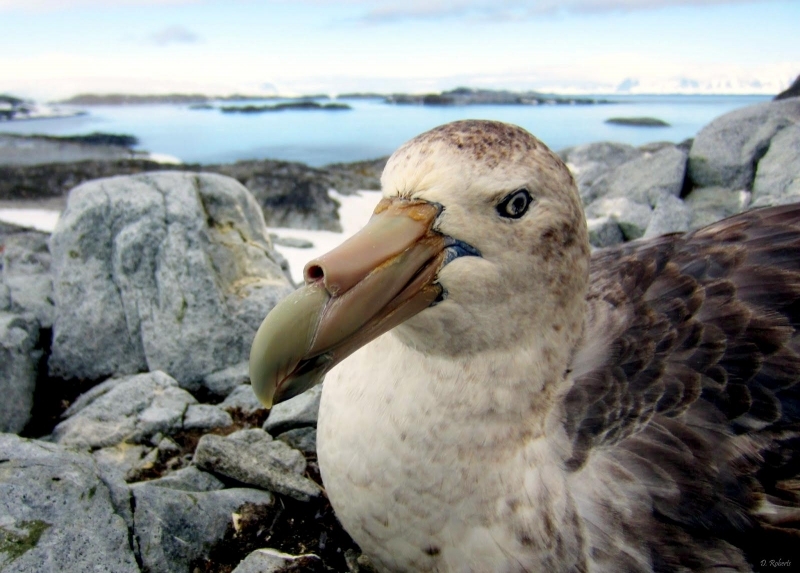 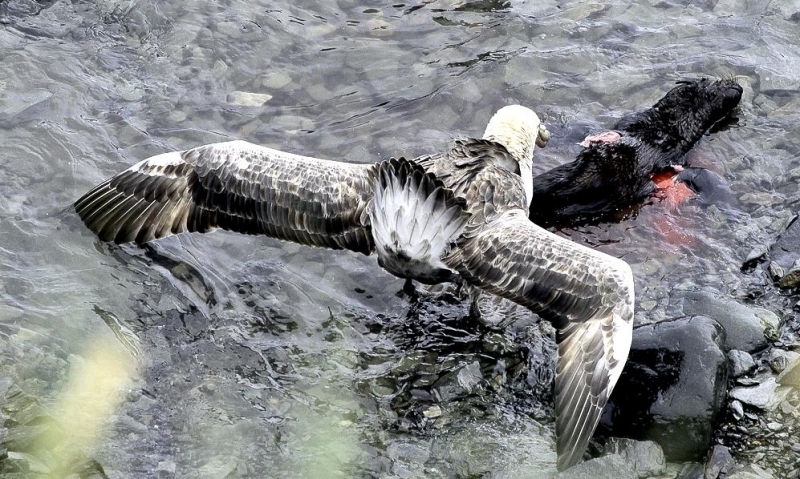 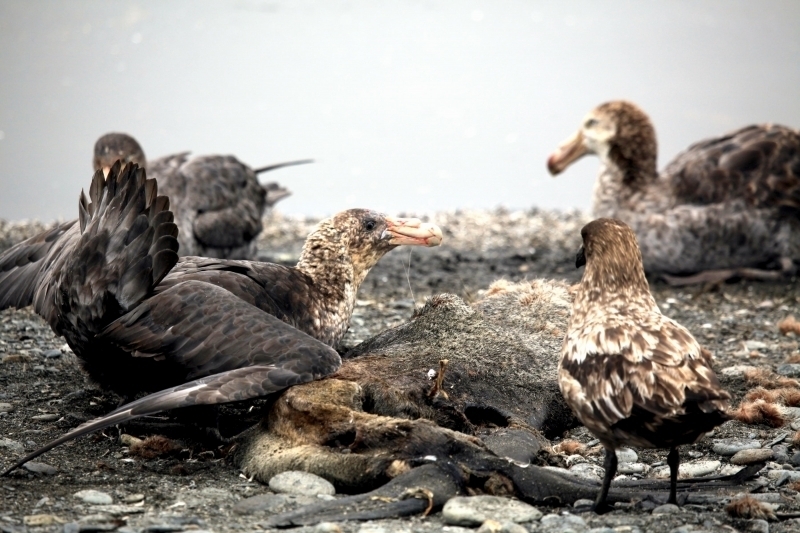 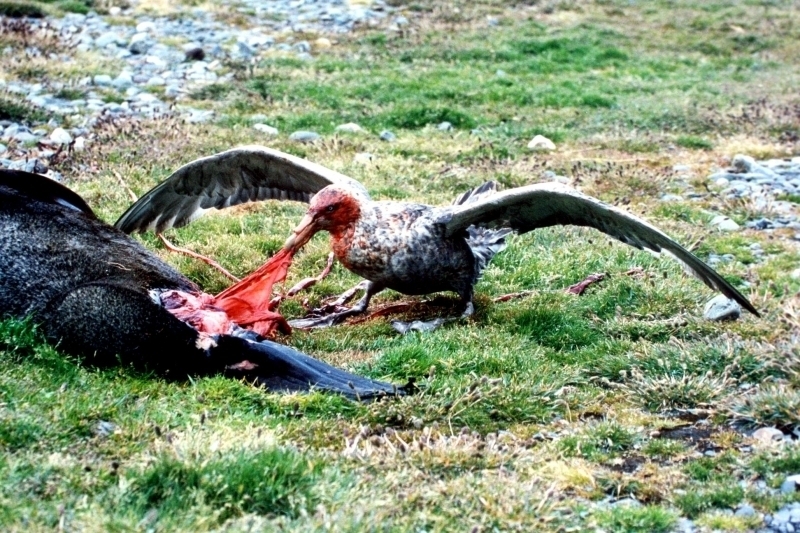 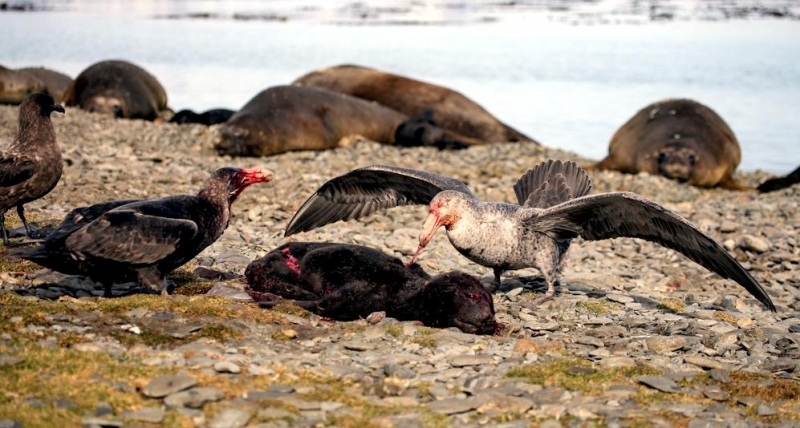 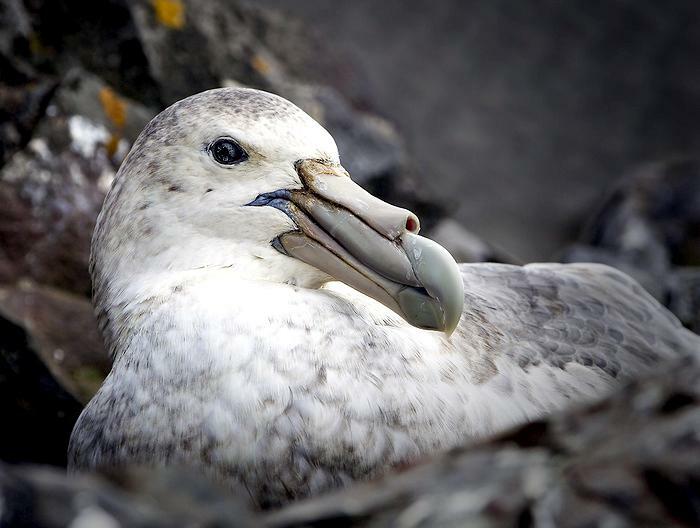 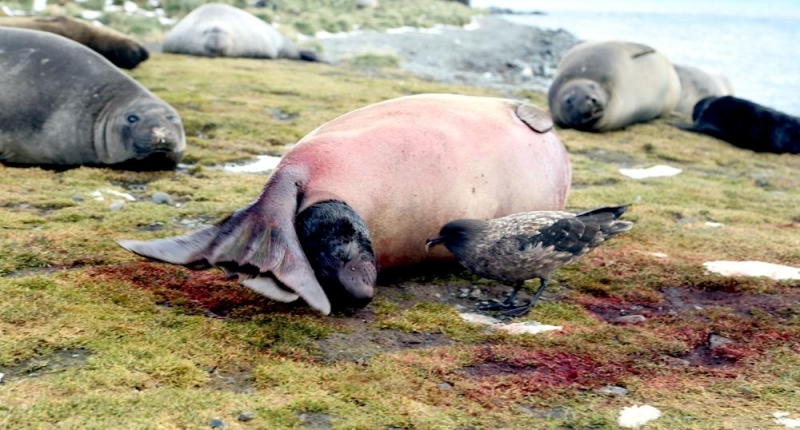 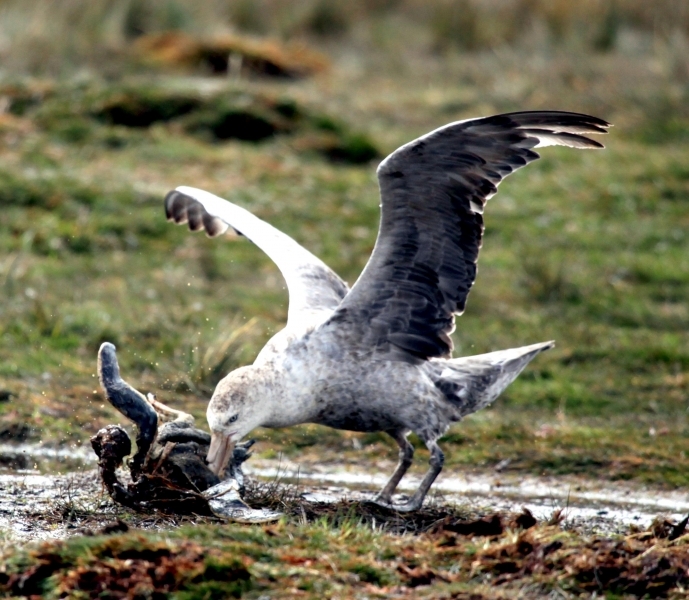 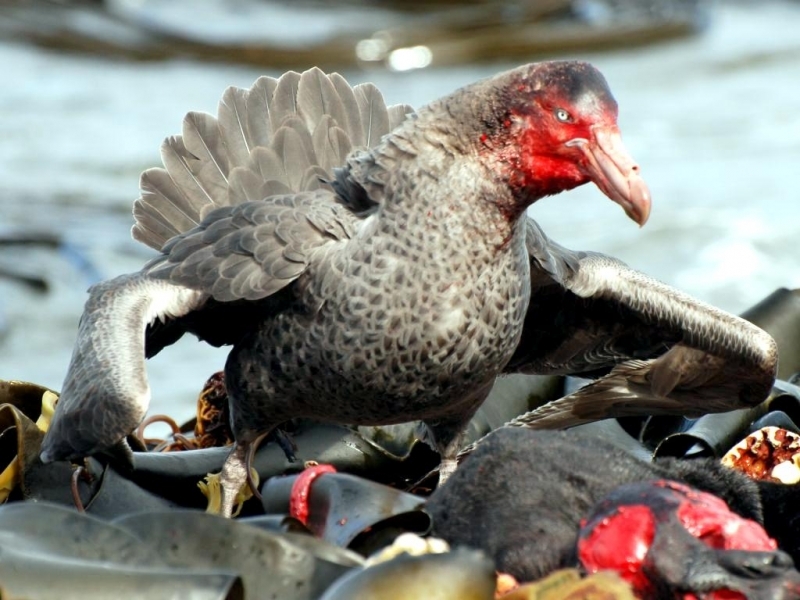 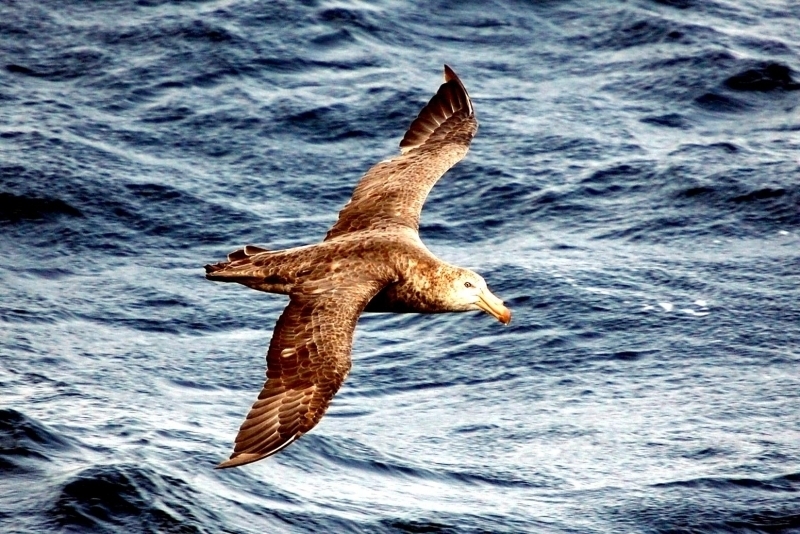 Giant Petrels feed on krill, squid, fish, other small seabirds including penguins and carcasses of marine mammals. 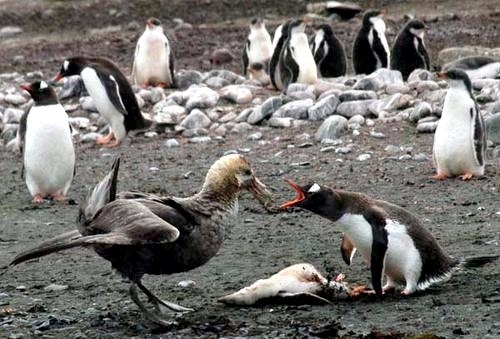 However, it has been shown that there is a significant dietary difference between the sexes. 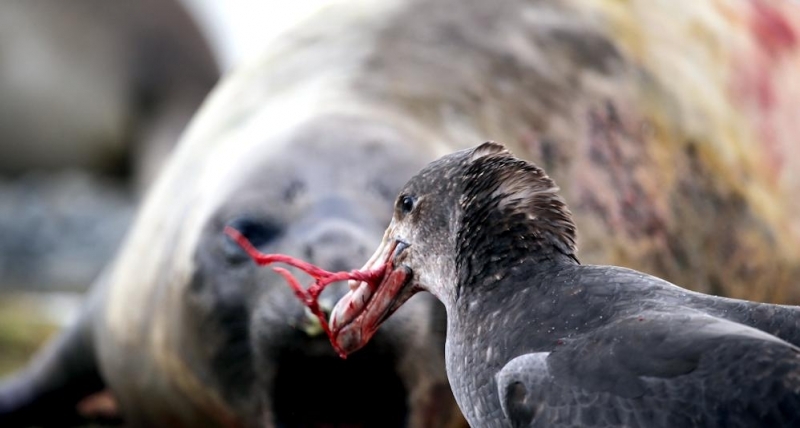 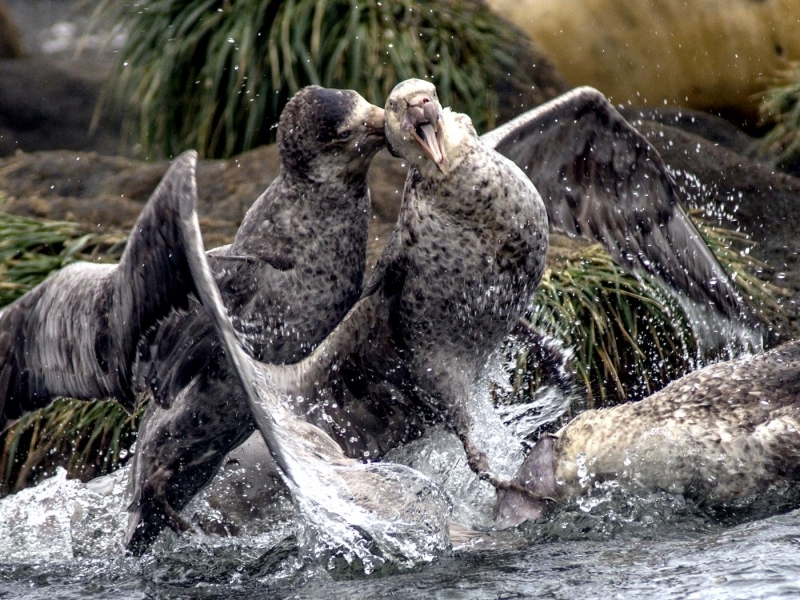 Females feed more on live prey at sea such as krill, squid and fish whereas males feed tend more toward carrion.